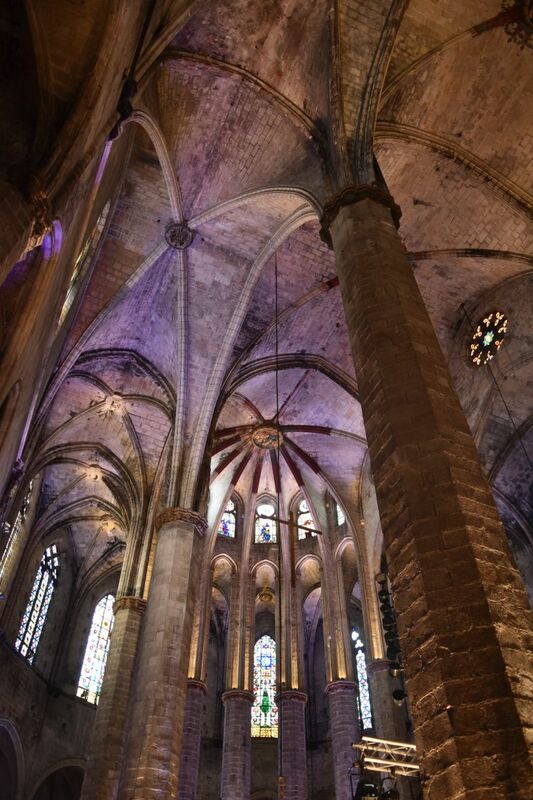 Barcelona with its modernist and gothic districts – this is our plan for Friday. We take the train at 6:40, should arrive at 8:11, but arrive more than one hour late at 9:30. Trains in Spain – this is a special rhyme. At the Passeig de Gracia station we leave the train. We refresh ourselves with two very, very excellent espressos and very, very delicious croissants… and then we start to scout for the modernist houses on the Passeig de Gracia and around it. 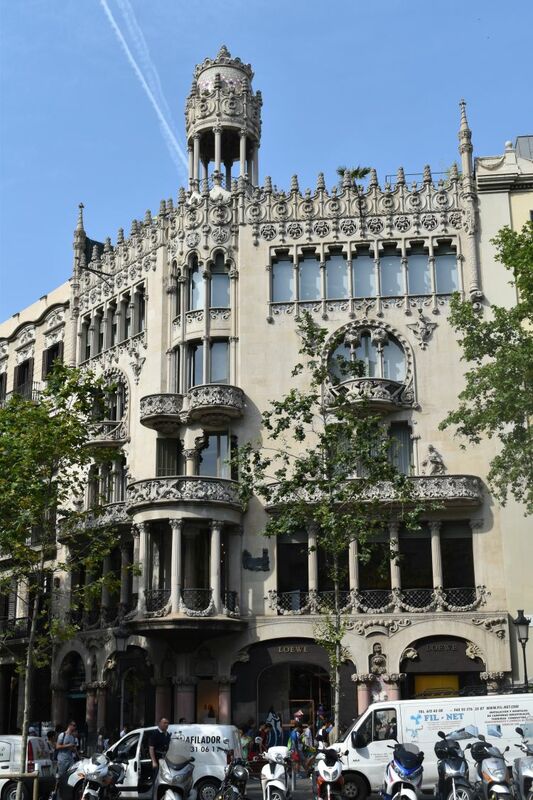 We are in the Art Nouveau Eixample district that was plannend and built in the beginning of the 20th century. Near the train and metro station is the block of houses that is called “La Manzana de la Discòrdia”. There are four modernist houses here and a fight (discòrdia) about which being the most beautiful of them. 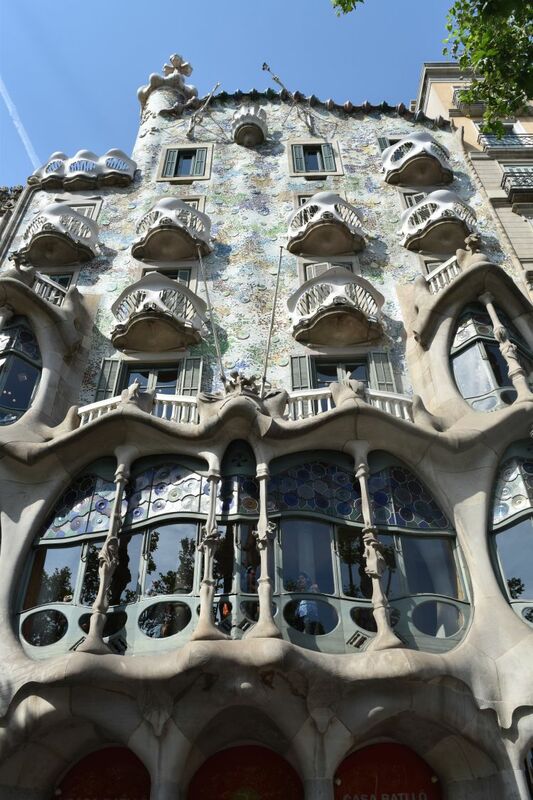 Gaudí’s Batlla house surely attracts the most tourists now. The other three houses have a lively and cheerful decoration that I prefer. This is the Casa Léo Morera built by Lluis Domenech i Montaner. We will meet this architect later in the Paleu de la Musica. Even the public benches are a good match to the “swinging” modernist atmosphere here. 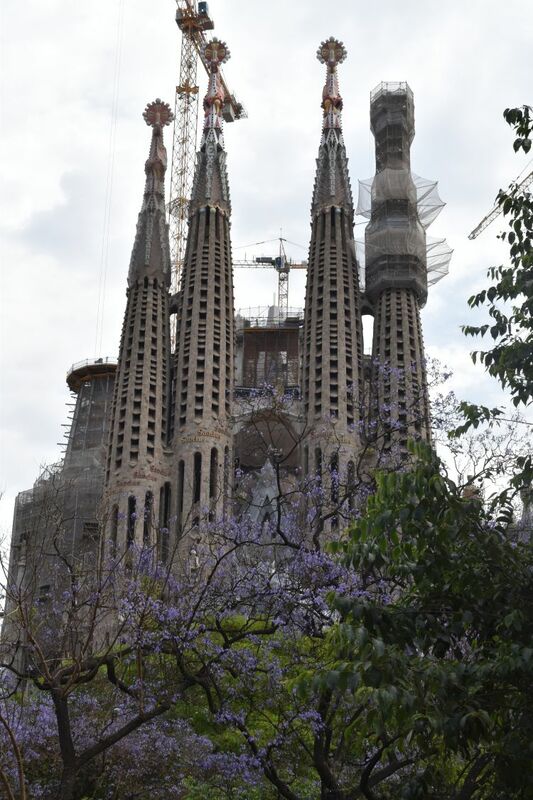 Walking in Carrer Mallorca, we see them already from far: The towers of Gaudí’s unachieved master piece, the Sagrada Familia, point to heaven like slim needles, akwardly accompanied by construction cranes, as this church has not yet been accomplished. 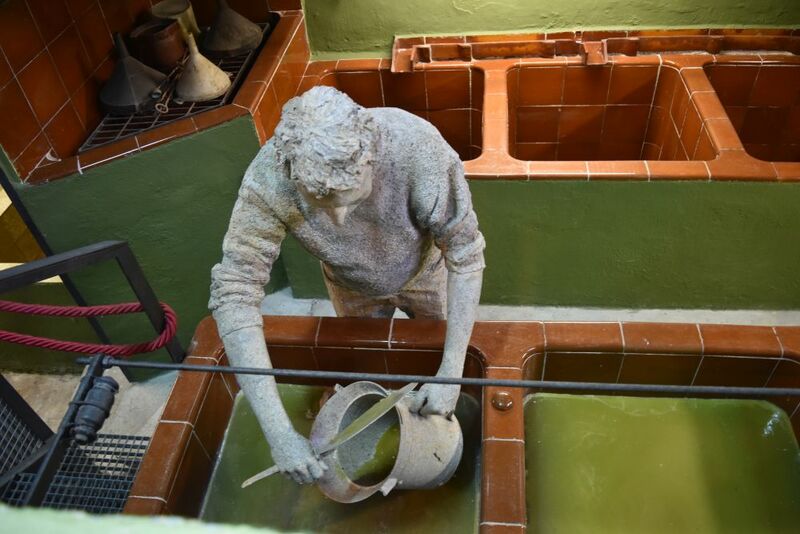 (Gaudí had started building it in the beginning of the 20th century, then died and the construction had been stopped for some time during the civil war of the thirties and the Franco regime). 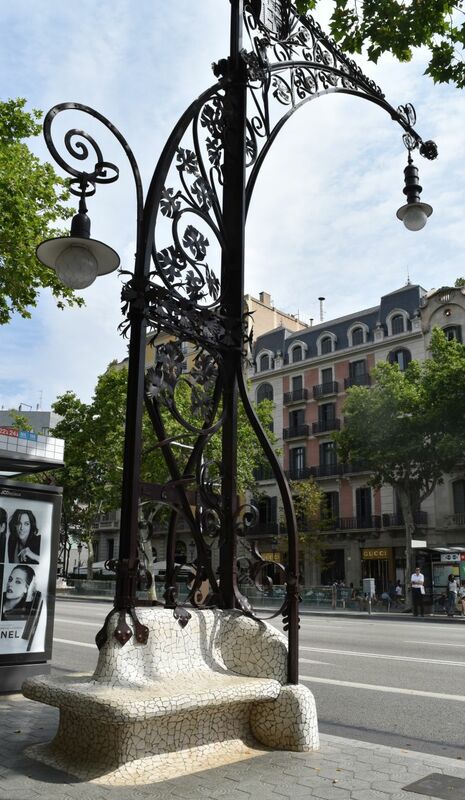 … and then continue by metro to the Palau de la Musica. 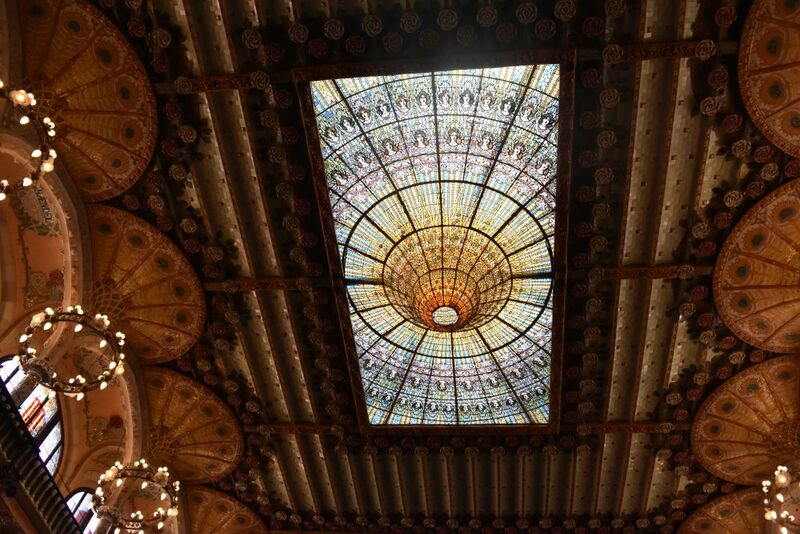 The modernist Palau de la Musica Catalana is located in the Barrí Gotic amidst narrow streets. 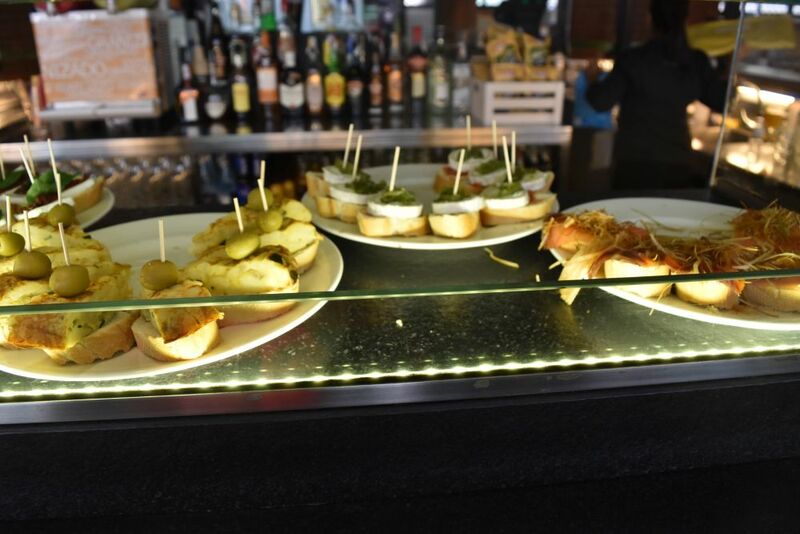 There is a nice cafeteria, where we first recover eating tasty montaditos varts. Then we join an Italian speaking group (they are the smallest group) to explore the modernist palace of music. The highlight is the concert hall for about 2000 people: The lamp on the ceiling is a window that lets in natural light. The stage is decorated with muses holding a ribbon. The main entry is in a narrow street. There are two large gates. The coaches used to enter the first gate, let the passengers out and then leave through the second gate. No longer today. Concert visitors enter through two huge revolving doors built into the gates. I love this cheerful palace of music. 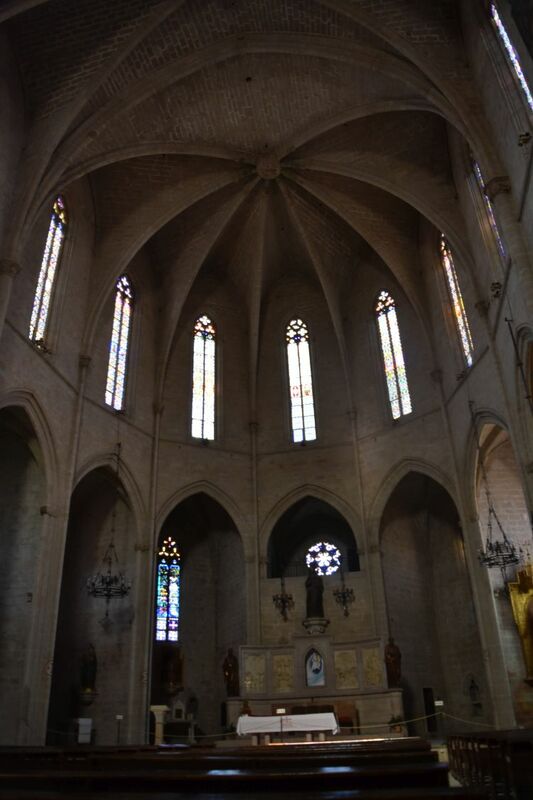 It has been built in 1908 as a stage for the national choir (orfeo) of Catalonia. 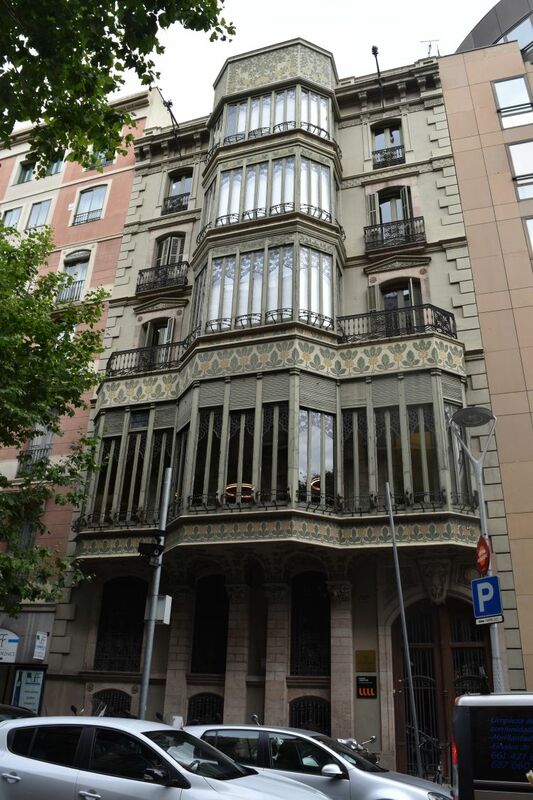 The architect was Lluis Domenech i Montaner that we already know from the Manzana de Discòrdia. 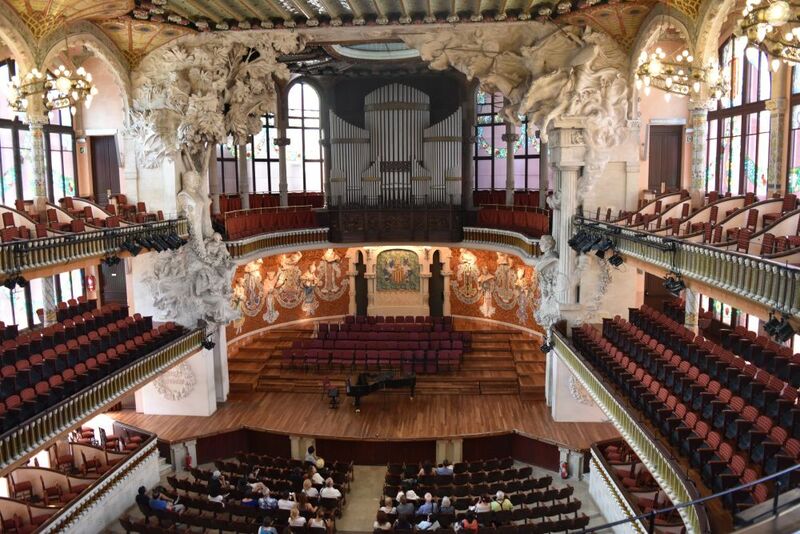 And yes, this music palace has a nationalist purpose for the Catalans, but it has also become a stage for many very different renowned music artists – classic, jazz and folklore. Enough Art Nouveau or Modernism. We feel like more modest gothic master pieces. 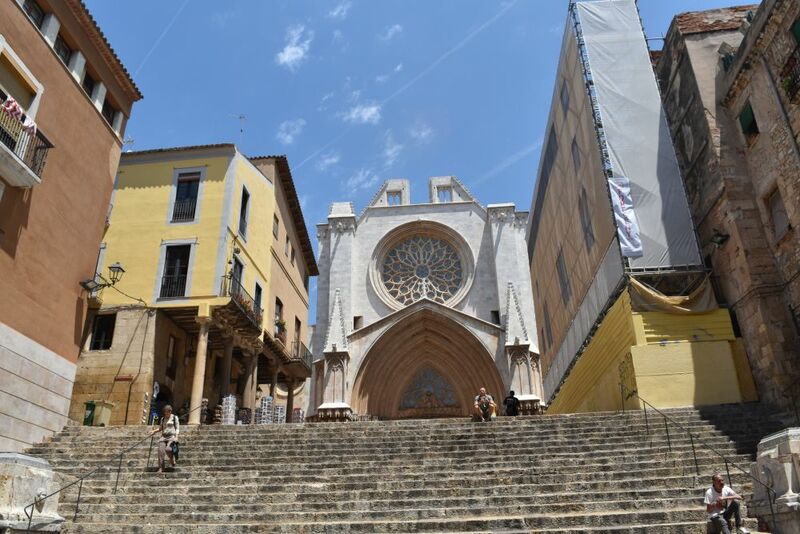 The gothic cathedral is not far and we walk through the narrow streets (“Gässli”) of the Barrí Gotic. 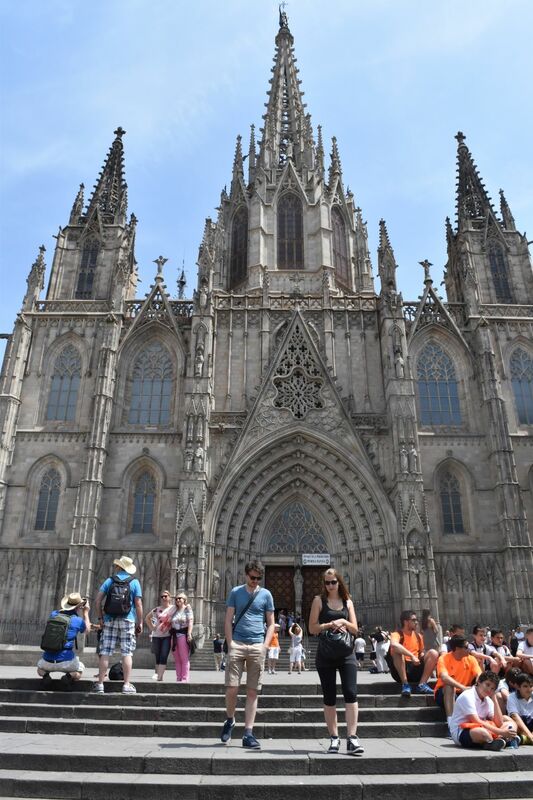 Construction of the Cathedral of Barcelona started in 1298 and lasted until 1450. The facade has been completed in the 19th century. The nave points to heaven with its high gothic vaults. 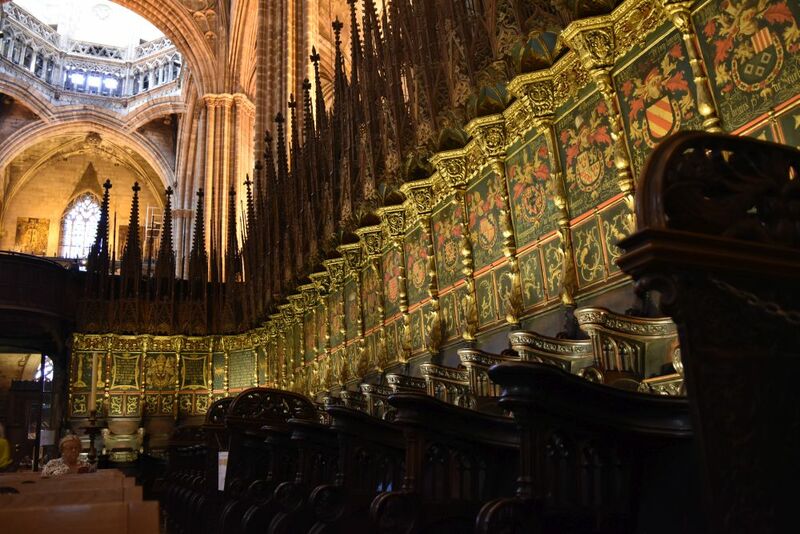 The choir is in the middle – for me a heavy design somewhat offsetting the airiness of the gothic vaults. Here are the richly decorated stalls. “Do you believe these geese are kept appropriately to their species”, Ursula asks me. I am not sure. 13 geese walk and stand on the cloister tiles. If they wish they can have a bath in the fountain. The 13 geese commemorate the martyr Eulalia that died at the age of 13 years. A lift takes us to the roof. We enjoy a beautiful view to the Mountjuïc and the church Santa Maria del Pi which is our next target. 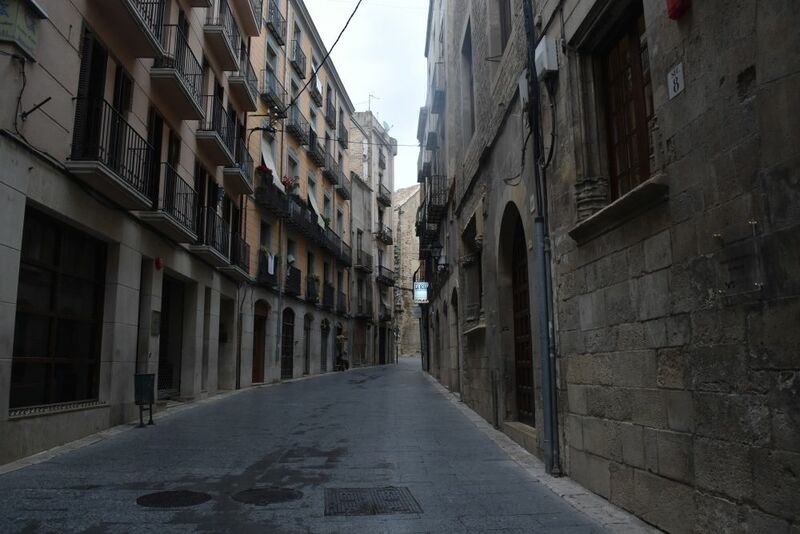 We continue to stroll through the narrow streets of the Barri Gotic and at the charming Plaça del Pi we have a drink. A group of musicians plays one tune of about 2 minutes five times – no, not all of them have talent. 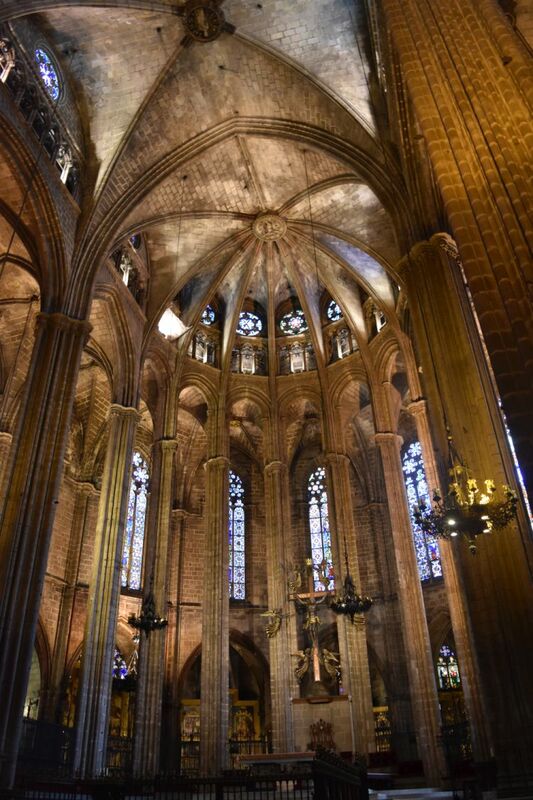 The church Santa Maria del Pi is one of my favorite in Barcelona. We sit on the bench and breathe in the harmonious atmosphere. 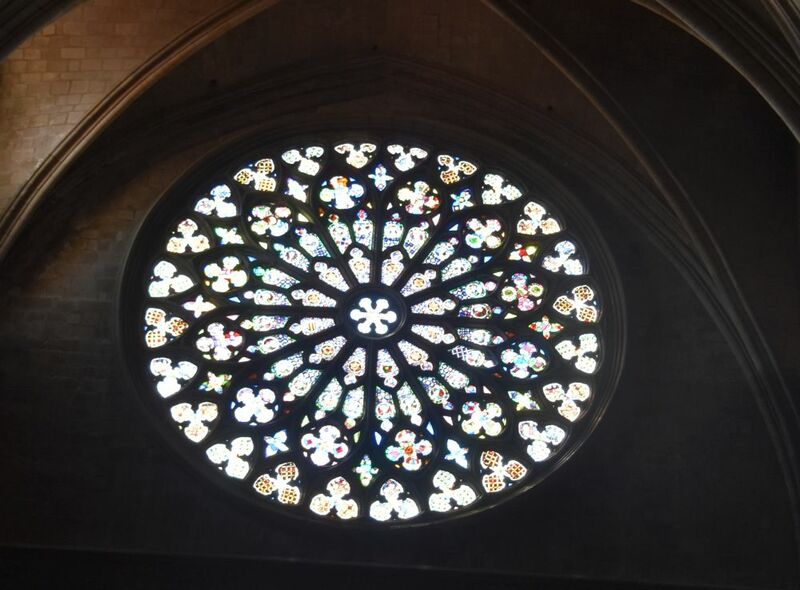 The windows have been destroyed in the Spanish War of Succession and the Rosette – one of the largest in the world – in the Spanish civil war of the 1930’s. Yes, the Catalans have been unlucky teaming up with the “wrong” side, and I learn that another problem was that the rich upper class not really supported the Catalan fight for their independence, but cooperated with Madrid. Hence they lost in the War of Succession shortly after 1700 and in the Civil War in the 30’s of the 20th century. 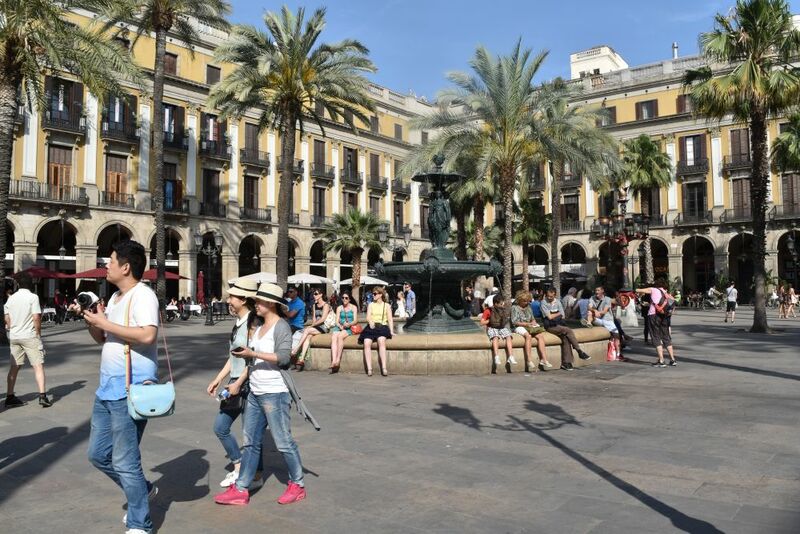 We join the crowds on the Ramblas of Barcelona and then turn left to say hello to the Plaça Real. 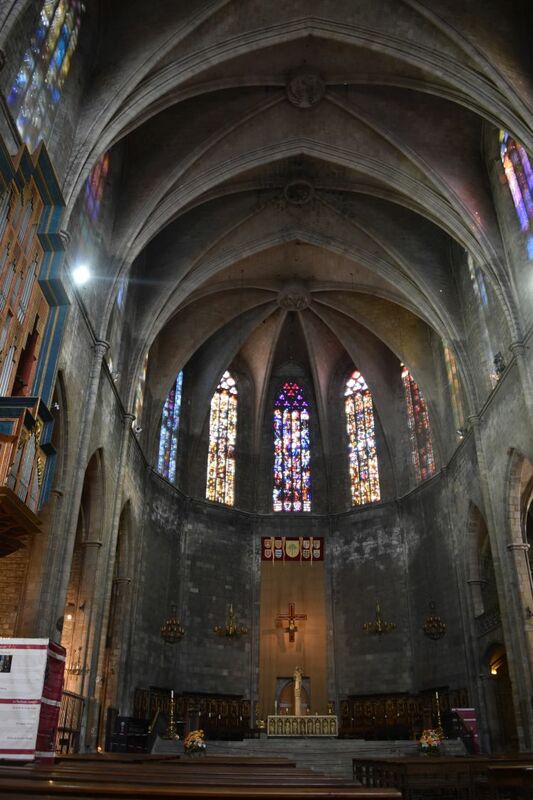 Santa Maria del Mar has been built rapidly from 1329 to 1370. I love the harmony of the homogenous style. We sit on a bench and enjoy the harmony. As always when in Barcelona, I say hello to the monument of the Catalans which is not far from Santa Maria del Mar. Yes, the Catalans fought bravely on the side of the Habsburgians in the war of succession in 1713/14 – but it was the Bourbons that won this war. The Ribera district would be great for dinner or Tapas, but now we head back to the Passeig de Gracia to catch the 19:25 train. Arriving with the metro at Passeig de Gracia we first figure out which metro entry gives access to the trains. We find this entry three cross-streets to the north. Under the earth, we are confronted with automatic gates, but our tickets (sold in the train) do not open them.We ask and are told to press “the” button (a bell) – then someone will open a special gate. Okay, but where is that magic “the” button? Ah, here it is, the rightmost gate has such a button that could be “the” button. We press it to ring. No one opens… But then a man leaves the Renfe train area through the flipping door next to the button and we catch the moment to enter. Uff. The train leaves precisely on time at 19:25. In Tarragona we are precisely on time. Ursula says: “Look, at 9:15 we will be at home on our balcony in L’Hospitalet.” But then the train stands for half an hour in Salou and loses another half hour, until we arrive in Hospitalet one hour late. No, no… train and Spain ARE not a good rhyme. With a glass of Vermouth from Gallatrops we finish another beautiful sightseeing day. Another Tuesday in June 2016. 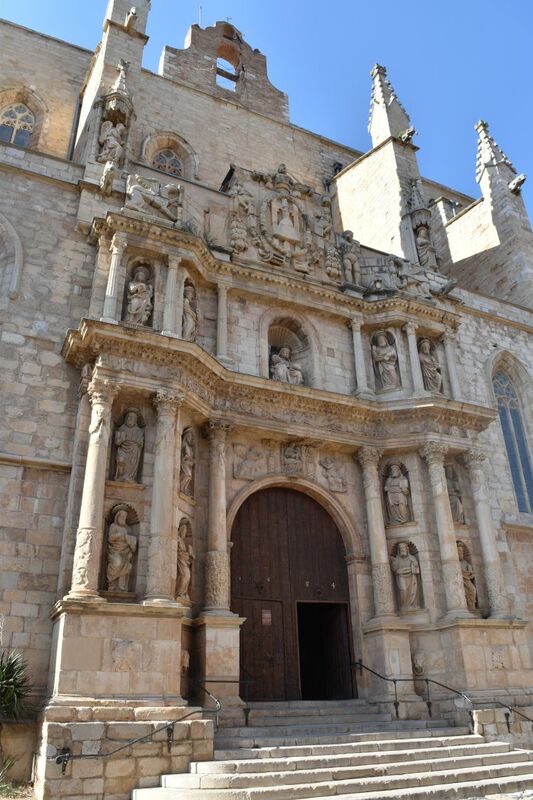 Today we visit Tarragona, the Roman capital of Hispania Citerior (then called Tarraco), the medieval town with its Romanesque-Gothic cathedral and the relaxed Ramblas Nuevas of today’s lively Catalan city. The train leaves L’Hospitalet at 8:27, in theory. The next train would leave at 8:55, and this is, when we actually leave. I believe they have just skipped one train. This must be Spain and trains. … and then stroll along the Ramblas. There is a market. Cloths, handbags and shoes are on sale. I buy a blue beach dress for 5 Euro. Then we head to the old upper town. 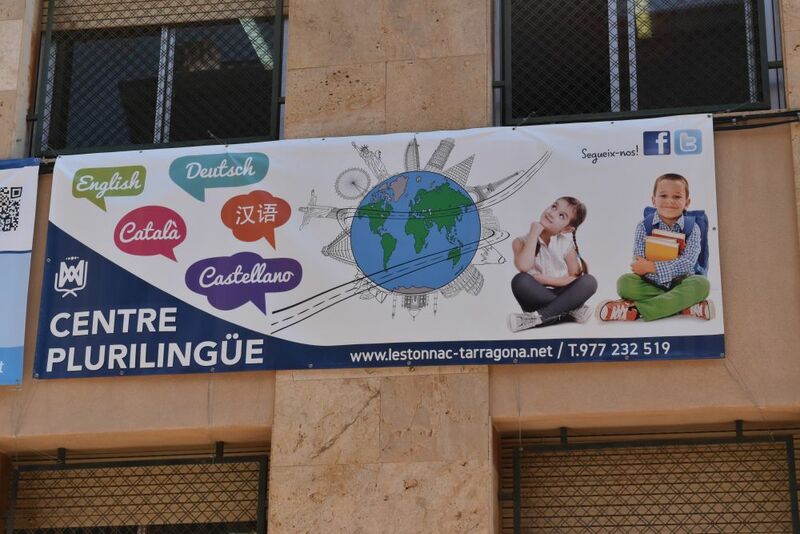 I notice that there are many multlingual schools in Tarragona. No wonder, Catalans already are bilingual to begin with and hence are more open to multilinguality. 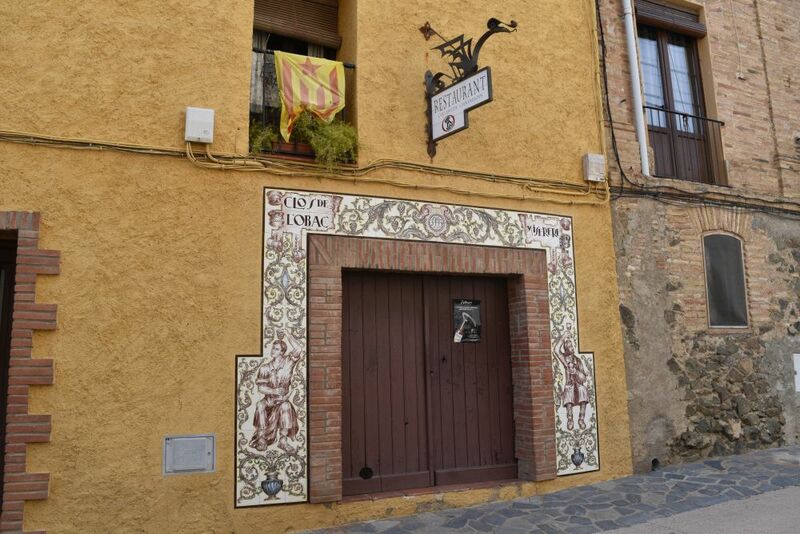 As compared to earlier visits I have noticed that the Catalan language is much more present – signs in the town are all in Catalan now – just that and practically no Spanish. 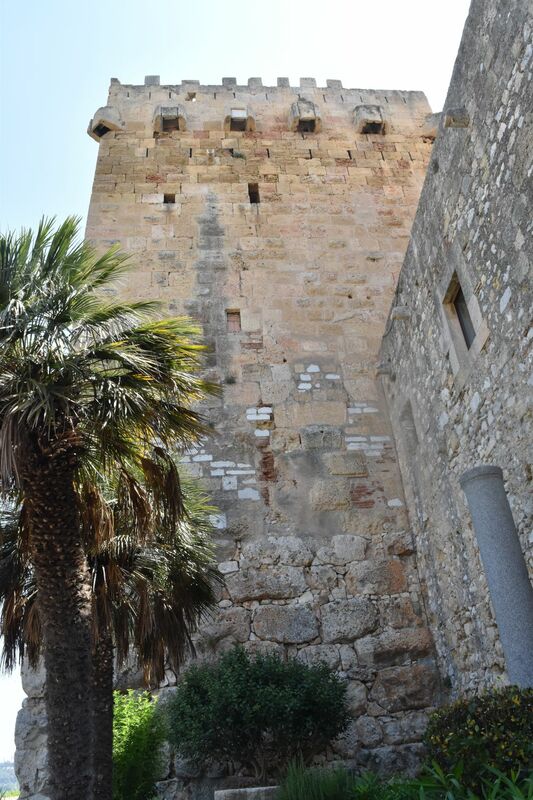 … and some towers have later been fortified to resist gunfires. 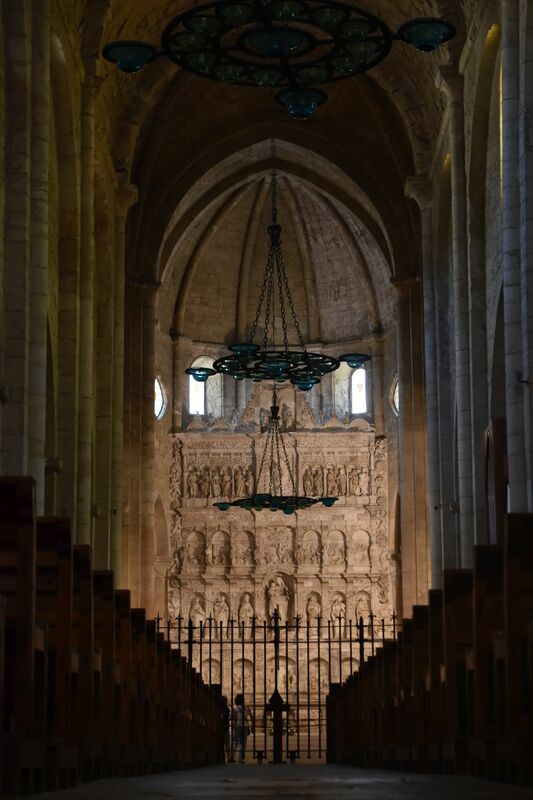 Built from 1171 to 1331, the Catedral de Santa Maria demonstrates the transition from Romanesque to Gothic. This is the main facade. Inside visitors are allowed to explore all details, also around the choir. 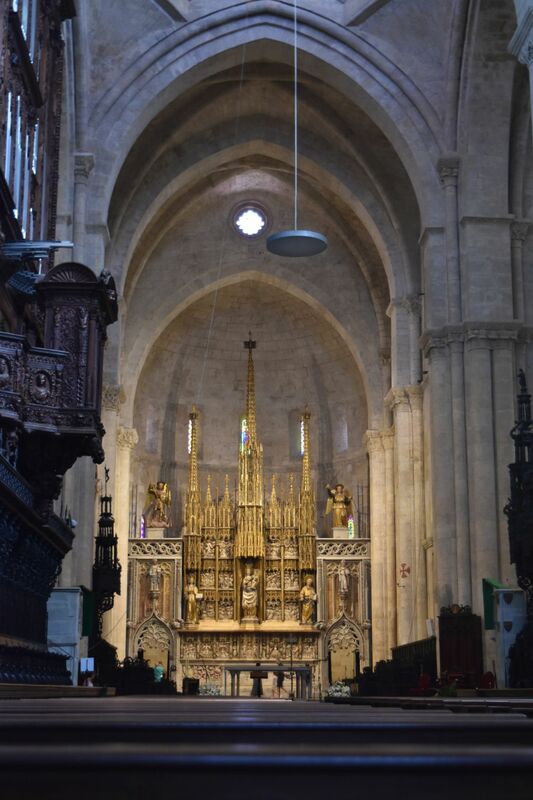 This is the nave with the altar. 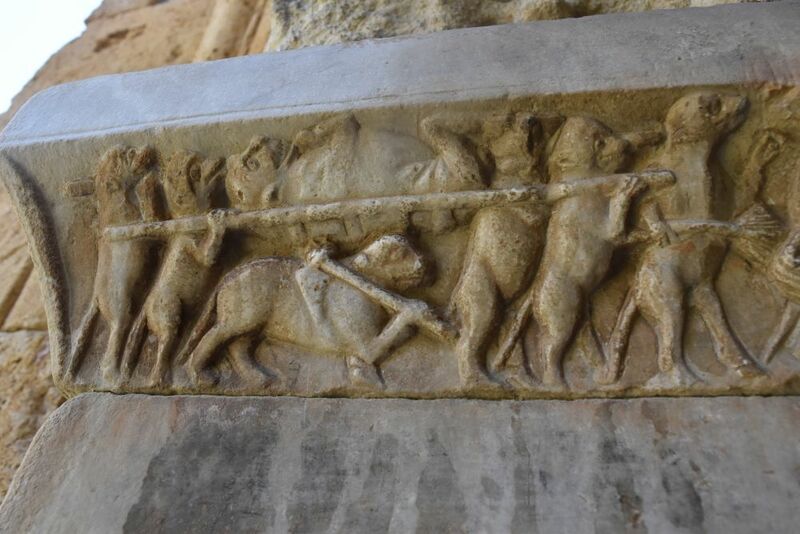 … and also a place to smile at the humor of the sculptor who carved the procession of the rats that carry the dead cat. After some tapas we visit the Archaeological Museum. Yes, Roman Tarraco has been founded by Scipio Calvus. 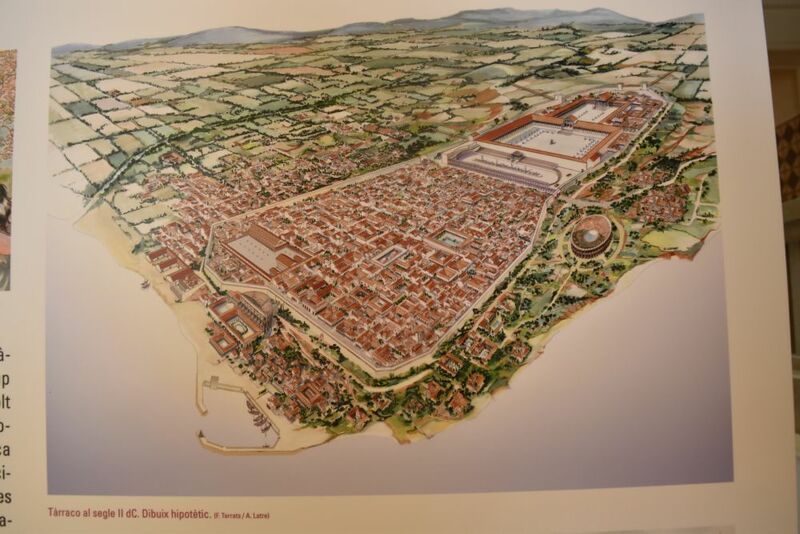 This is what the town looked like in Roman times. 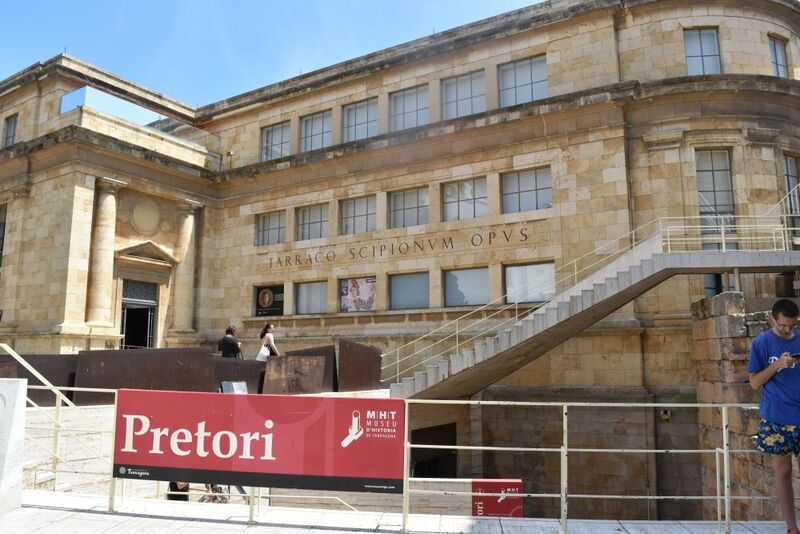 The museum has been constructed around the old Roman town wall – the wall became part of the exhibition. 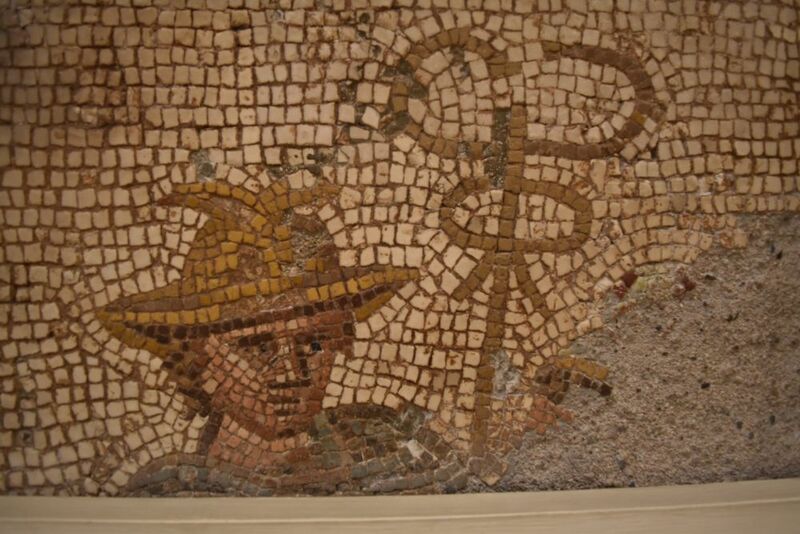 What I like most are the mosaics. 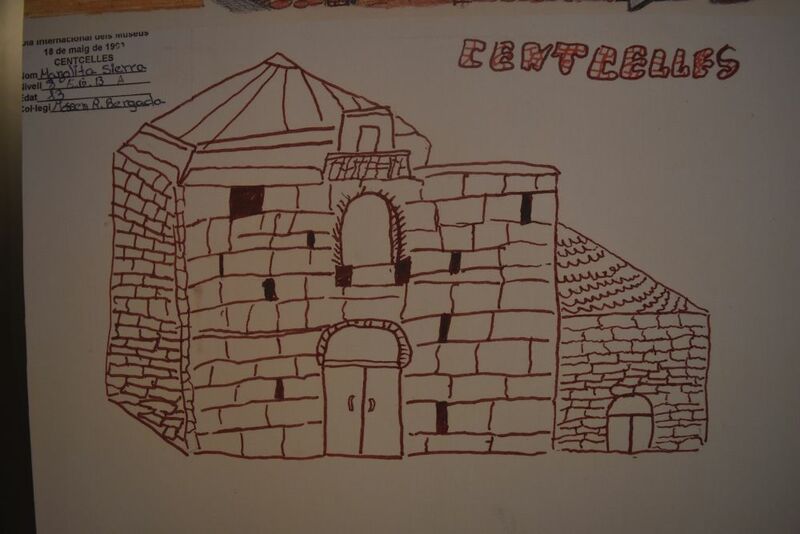 Cute is the special exhibition about the villa Centcelles with children’s drawings. Below the archaological museum is the entrance to the old circus. 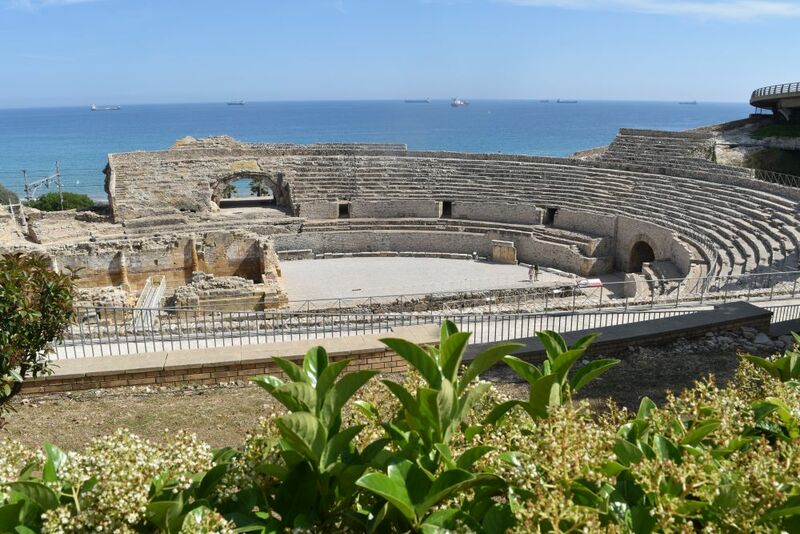 … and then we visit the Roman amphitheatre with its gorgeous view of the sea. 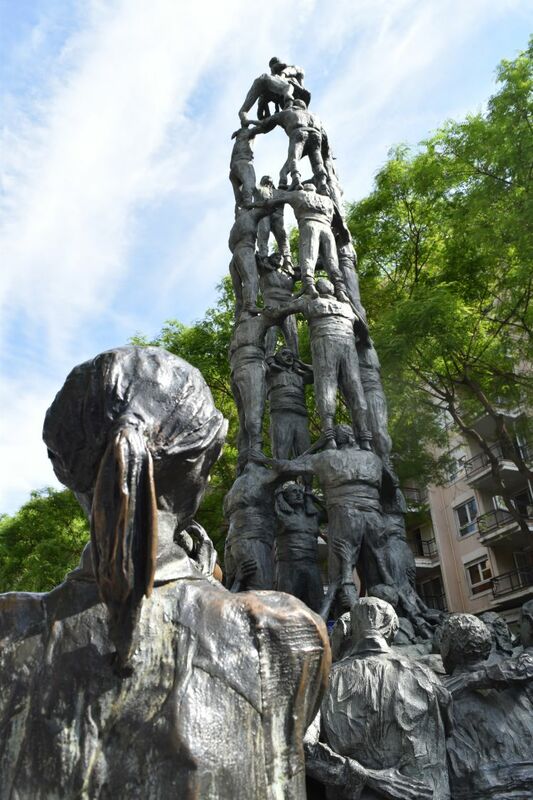 We return to the Ramblas Nuevas to see the statue of the tower of people (castell). 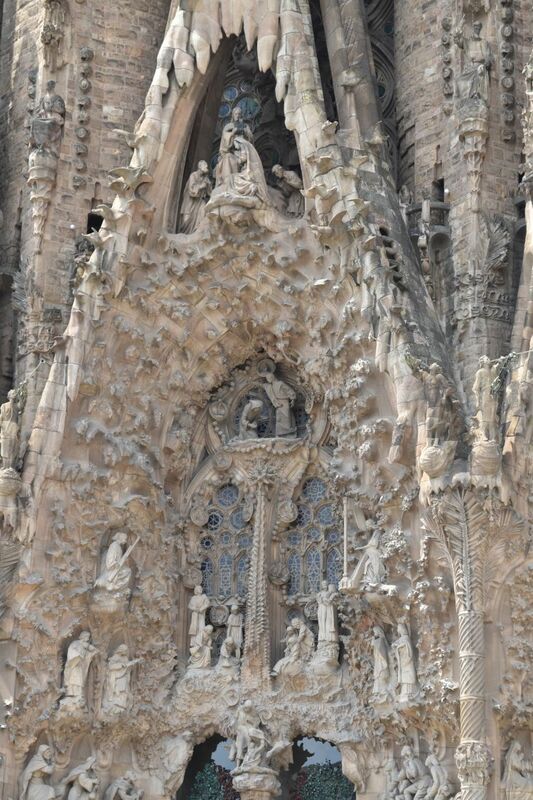 The habit to build such towers is said to demonstrate the will and sprit of the Catalans to cooperate. Our train of 19:09 arrives just a few minutes late to take us back home to L’Hospitalet. We leave, we arrive at Salou, we leave Salou, and then we stand… stand… stand… finally we hear this message: “There was an incident ahead, we apologize”…. 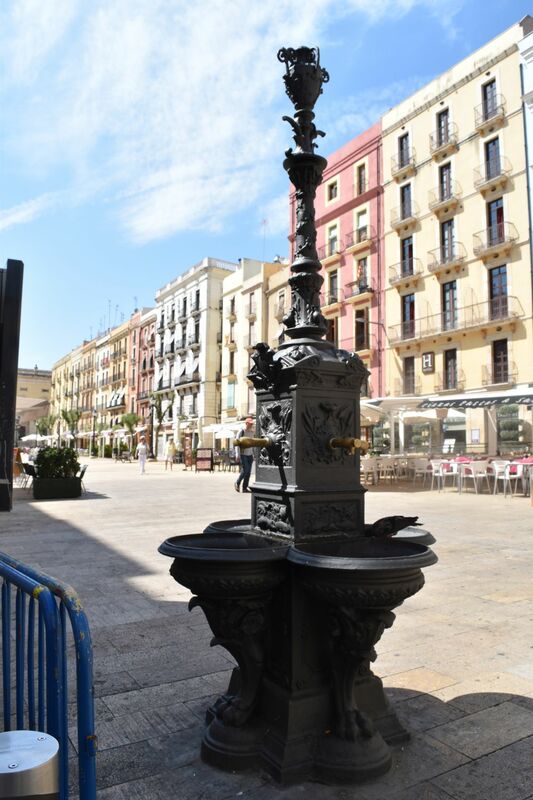 We continue to Cambrils and stand… and stand… and stand. It is very cold in this train… we stand… and stand… and around ten at night the doors close and the train continues slowly, but pretty steadily. Shortly before 10:30 we jump on to the platform at L’Hospitalet, find our car and drive back to the apartment. Uff. Will I ever again take a train in Spain? Well later I read that today Zurich had similar problems after someone had set a fire to the SBB railway cabling. Perhaps this delay has happened out of compassion with Zurich? But, more than three hours for a half hour train journey is quite a bit a record for me. Well subtracting the train incident, our excursion to Tarragona was a wonderful experience. Tuesday – we head off about 50km south to explore the last kilometers of the Ebro on its way to the Mediterranean sea. 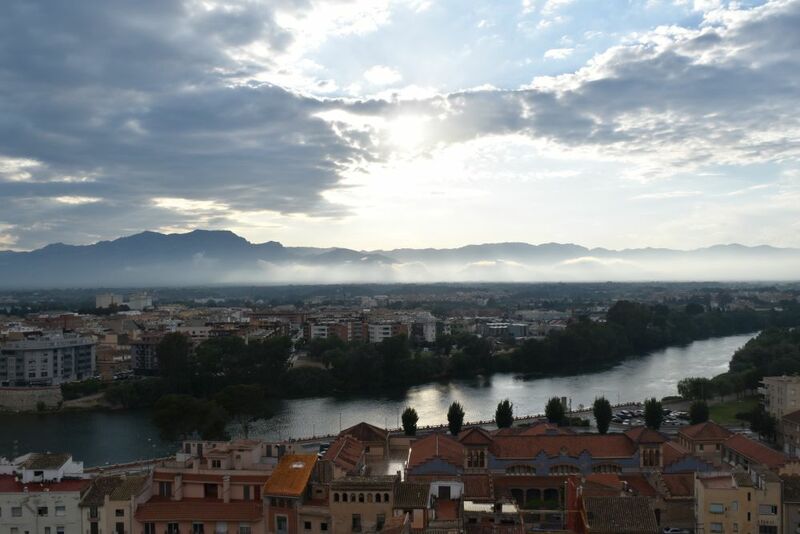 The delta and – more towards the mountains – the town Tortosa are our target. The Ebro delta looks like the hook of an anchor: In the middle there is the river branching into arms with lagoons. Two sandy spits go off to the north and south. The Ebro delta is one of the largest in the Mediterrenean. It has developed in the last eight centuries due to the deforestation which made the Ebro carry soil down to the Mediterranean sea. 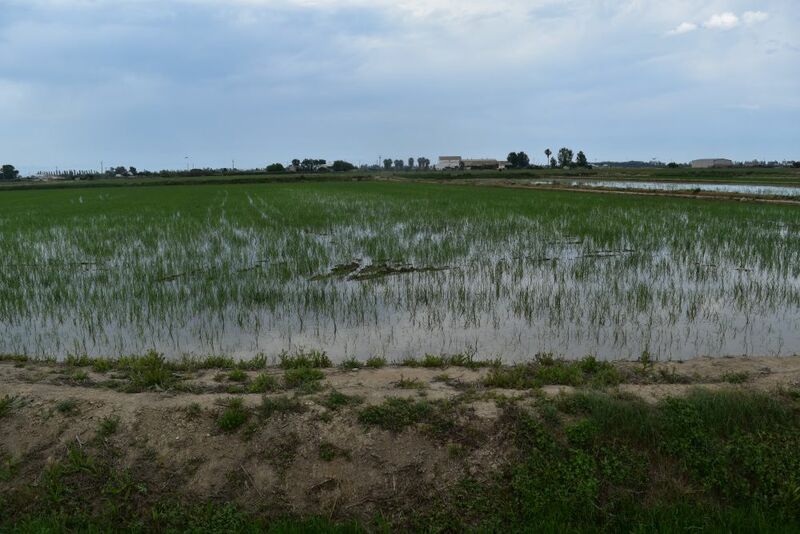 In the delta rice fields under water dominate the scenery, among them a few villages. Black and white egrets walk here on their long legs. A large part of the delta is a natural reserve, also visited by migratory birds – great for bird observers. In Deltebre we buy some rice products – rice “as such” and licor d’arròs amb herbes (rice licor with herbs). They even sell rice beer (not for me, I am not a beer drinker…). We continue to El Muntells and the Camping Eucalyptus. 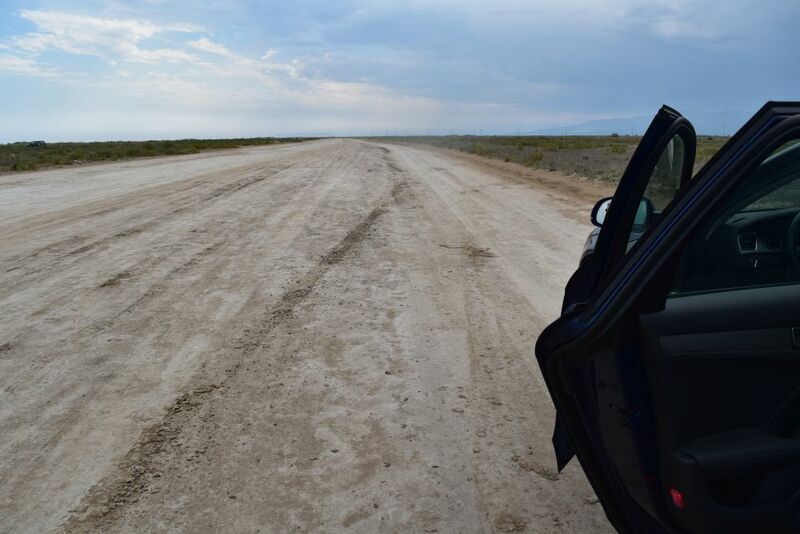 Here we find tracks that lead on to the sand. We follow them going south. Ever once in a while, we come across another car. It is a wild and lonesome scenery. 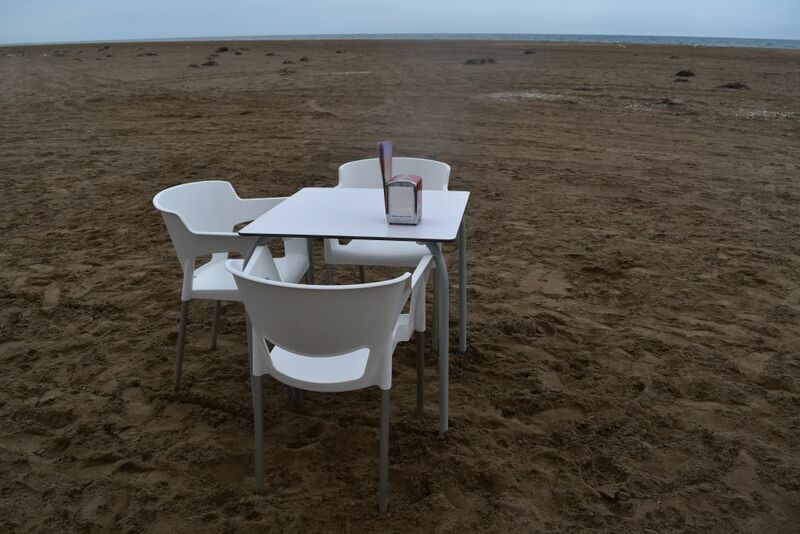 … and stop at a small xiringuito (beach bar) with a large selection of drinks and food. We join four Germans with four dogs of varying size – from “calf” to “guinea pig” – all four the color of sand – the smallest, the “guinea pig” barking loudly. It is very windy. My credit card, identity card and driving license fly out of my wallet and start to hop away on the sand. I run to catch two of them, but the driving license has disappeared. Finally we find it under the wooden beams of the xiringuito where the wind had carried it to. Uff. We continue to drive south, until Ursula shouts: “stop, see, we are here, on the spit. This goes nowhere…”. Right. And our car cannot swim, once we have reached the end of the spit. 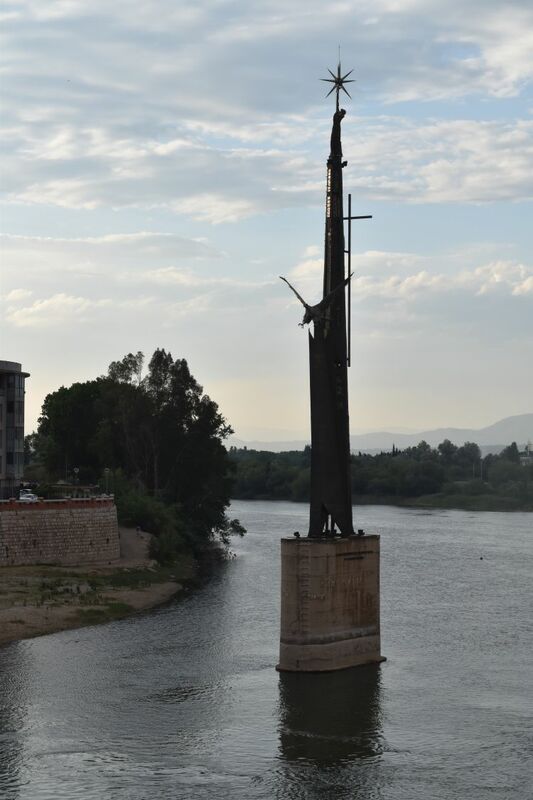 We drive back to the Camping Eucalyptus and then follow the Ebro to Tortosa. 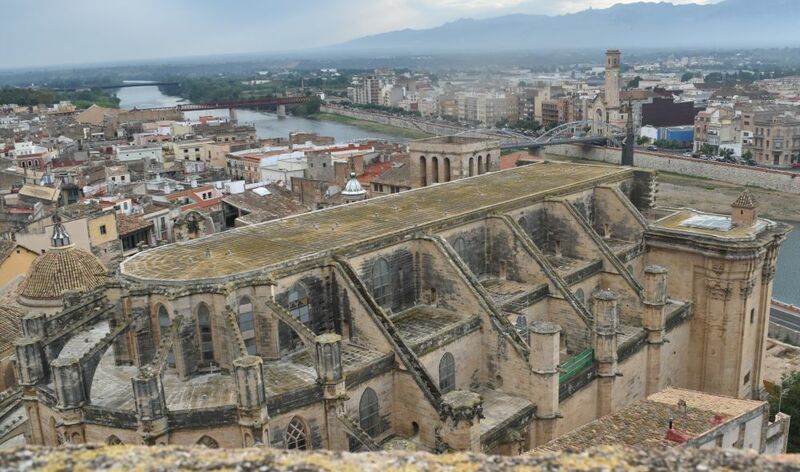 Tortosa, founded by the Iberians, then taken over by the Carthaginians and the Romans, was liberated from the moors in 1148. Highlights are the old city, the cathedral and the fortress that is now a parador. 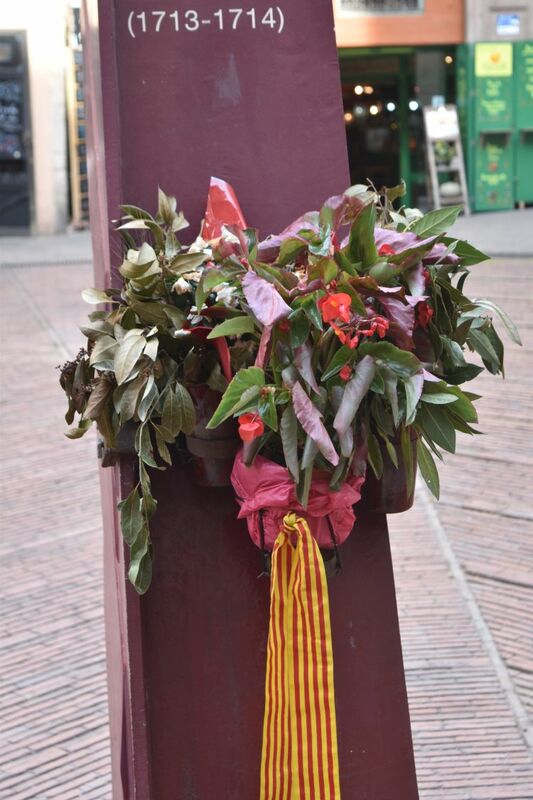 Franco has erected it to commemorate his victory of 1938 – over the republicans, and the Catalans had supported the republicans. 70’000 soldiers were killed here. A sad memory. … with the view of the gothic cathedral (closed after seven pm and uncompleted, as many such churches are here). This is the view of the mountains, just after the rain. Coming back to our car we find a fine of 40 Euros. Hm. Pretty expensive. Only later we understand that in Spain, blue zone means that you have to buy a ticket and place it under the front window. This is different from Switzerland or Germany where “blue zone” means “set your blue card to “show your time of arrival” and get back in one and a half hours”. Okay, the fine is, what we call “Lehrgeld”, meaning “paying for a lesson learned”. We return to l’Hospitalet shortly after 9pm which is still early for Spaniards to have dinner. 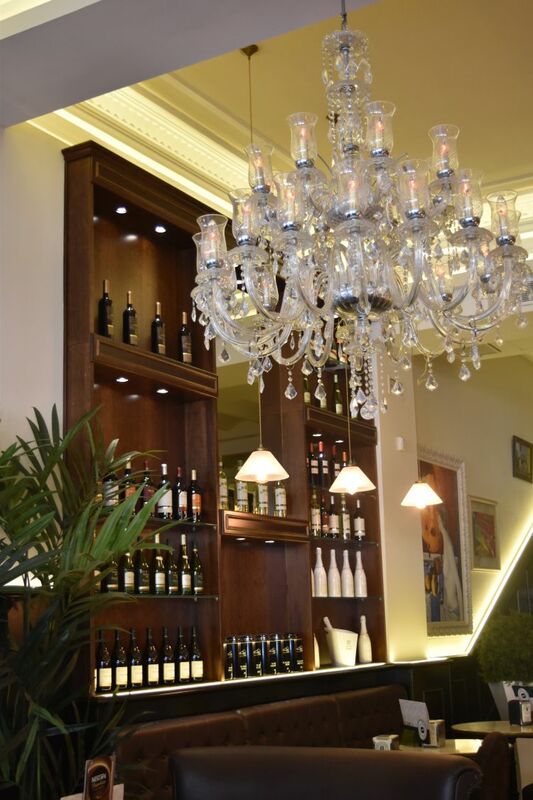 The “Olla” on Via Augusta 40 has changed its name to “Le Petit Normand”. I have a delicious rabbit with a glass of Granatxa from Montsant and Ursula enjoys duck. Excellent place. The owner is from the Normandie and has lived here for twelve years. Another beautiful sightseeing day to remember îs ending. 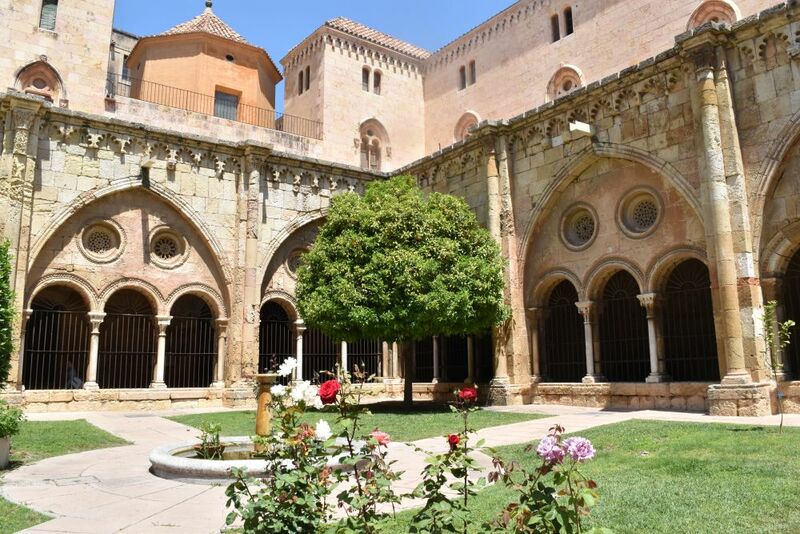 A round trip to the montains with two monasteries and to the aqueduct near Tarragona, this is our plan for a hot and sunny Thursday. with the vineyards hanging on the steep slopes. There is a great view of the mountains we have just crossed coming from the coast. There are more vineyards here… they surely are producing high quality wine given the low density of vines. The impressive mountain Montsant protects the monastery of Scala Dei or literally the “staircase to God”. This Carthusian monastery was founded in the 12th century, after the Moors had been expelled from the area. Backed up by the king, it became a powerful monastery with large land possessions. 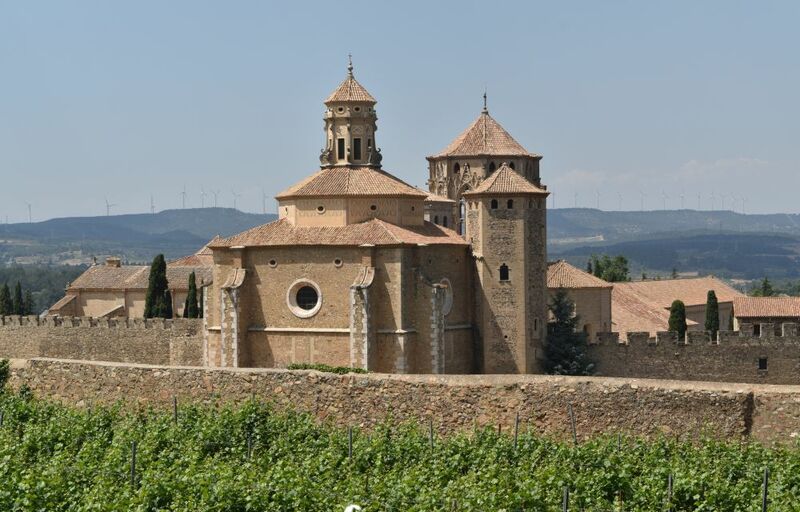 In 1835 the monasteries in Spain were expropriated. The peasants having felt oppressed for centuries destroyed it. We enter the ruins through the main gate with a statue of Maria decorating it. 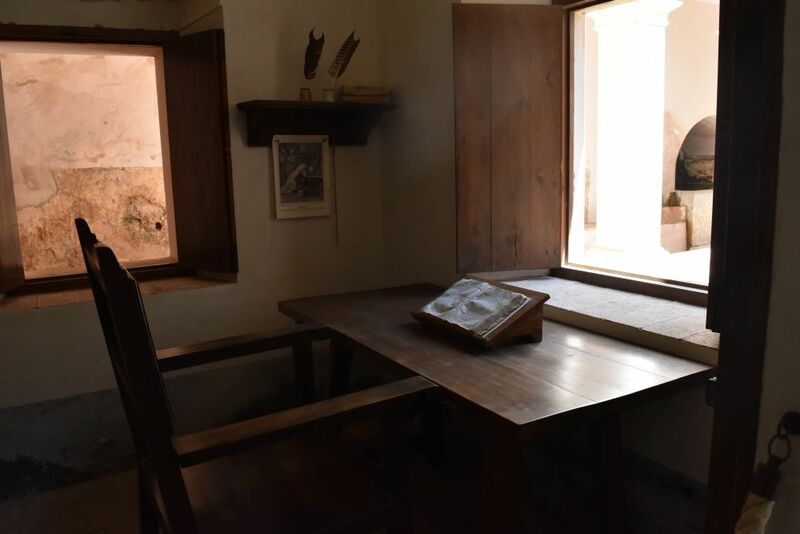 To understand how the monks lived, a cell with courtyard, kitchen, bedroom and work areas has been reconstructed. This is where the monks sat and read the bible. Also the cloister has been carefully reconstructed reusing parts from the ruins. Near the monastery we find a nice small restaurant, where we eat a full menu with salad and products from the area. The trout from the rivers has been cooked in the oven. A crema Catalana and a crema limón top our menu. The price of 15 Euros includes a jar of country wine – I can just take a mouthful (as I am driving). Some cyclists from Norway join us here and later a group of about 20 very noisy motor cyclists. I later buy some wine from the Scala Dei cellar. It is a Garnatxa or – in French – Grenache. 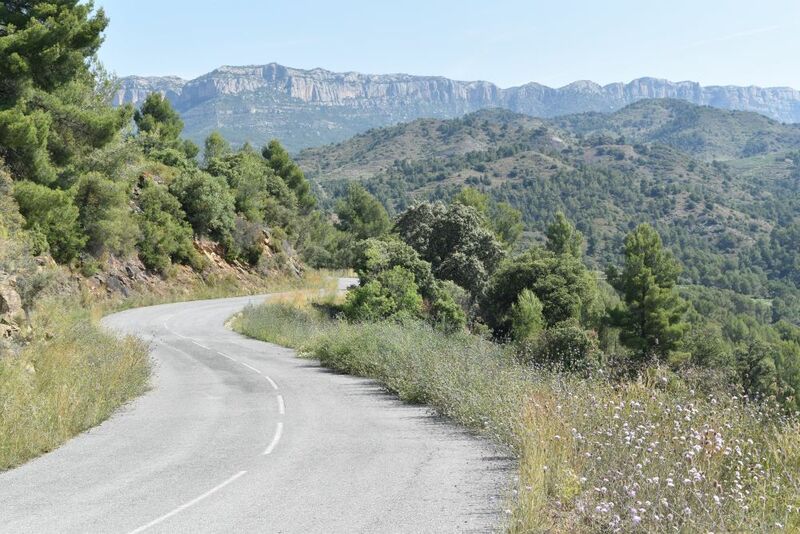 We take a road that winds along a mountain ridge and then down to the monastery of Poblet. This monastery is large (the walls surrounding it measure 1.5km) and is located amidst vineyards. 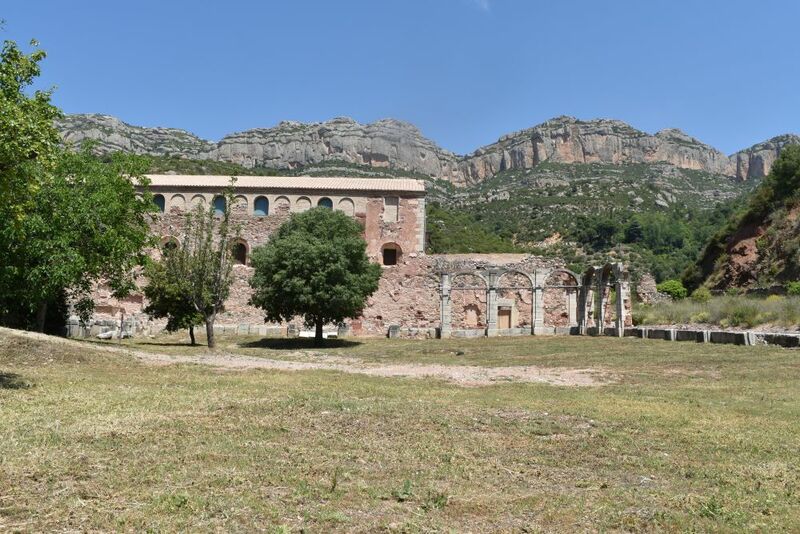 Like Sacala Dei, this Cistercian monastery was also founded in the 12th century and it has also been expropriated and destroyed in 1835. However, it has been rebuilt reusing what could be reused from the old monastery and now has a living community of monks. 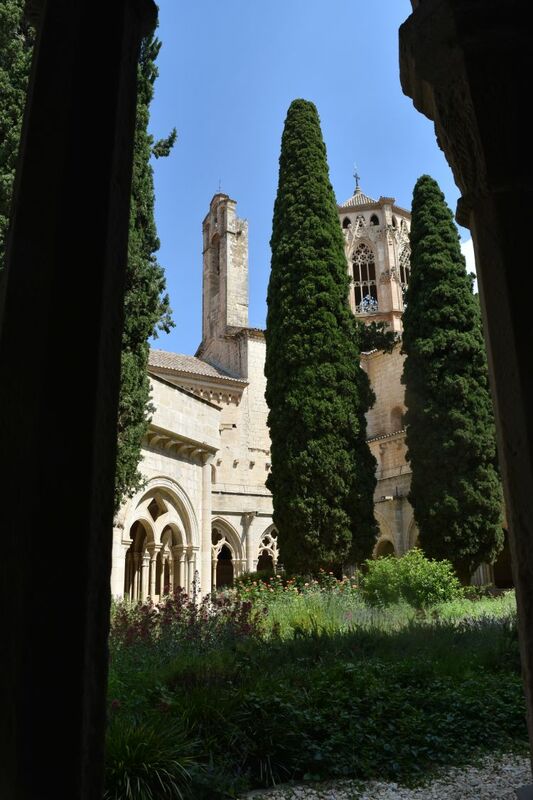 This is the cloister with the cypress trees and the fountain. From the cloister we enter the main church with the renaissance altar made from alabaster. 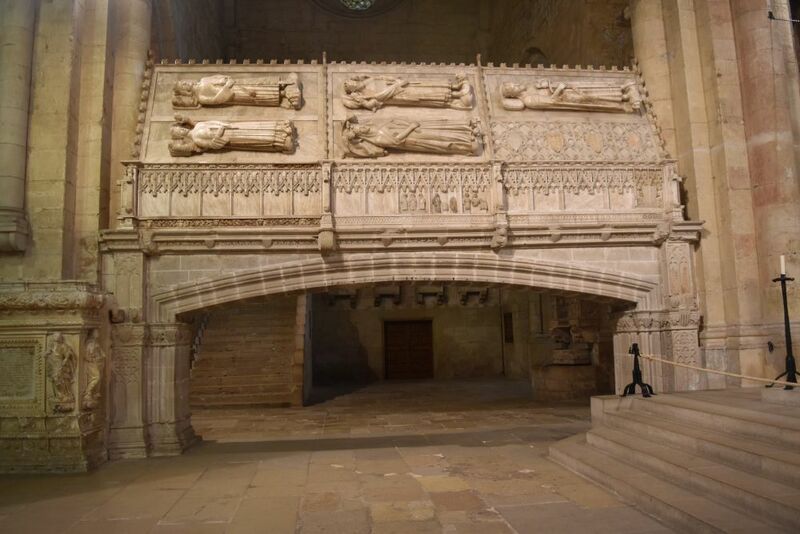 The kings of Aragon have been buried in these coffins hanging in front of the choir. We say good-bye to this impressive place. Stop over in the small town Montblanc – and why is it called “white”? Yes, here in Spain, we find a small town called Montblanc. Why is it called “Montblanc“? Perhaps the rocks are white? The guard of the church only can say that there is a mountain nearby also called Montblanc. Well, may be a small brother of “our” Alpine Mont Blanc covered with ice and snow? 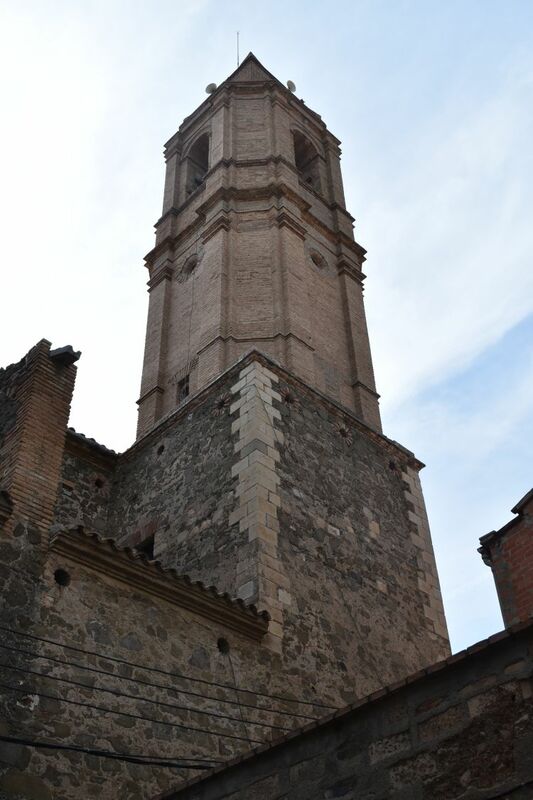 … we walk to the cathedral sitting on the top of the hill. The guard explains to us that this gothic church has not been completed. 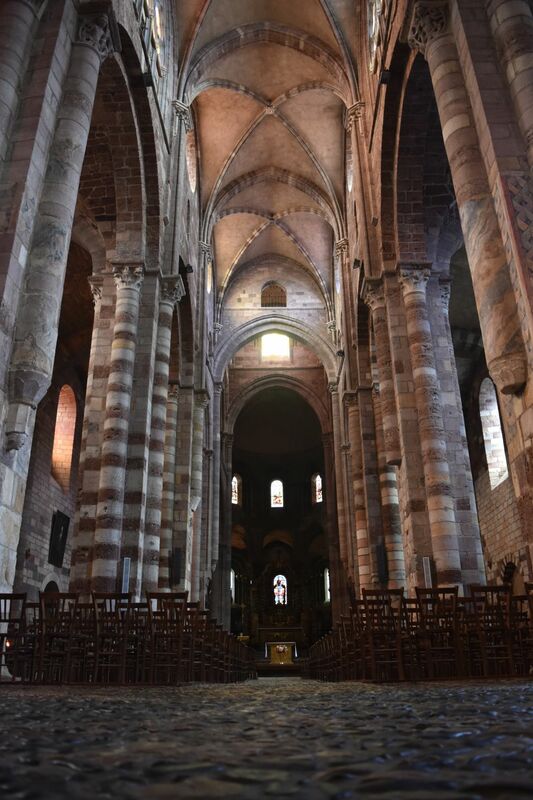 Right – the nave ends abruptly somewhat in the middle and there is also no tower. We climb to the roof and enjoy the view. 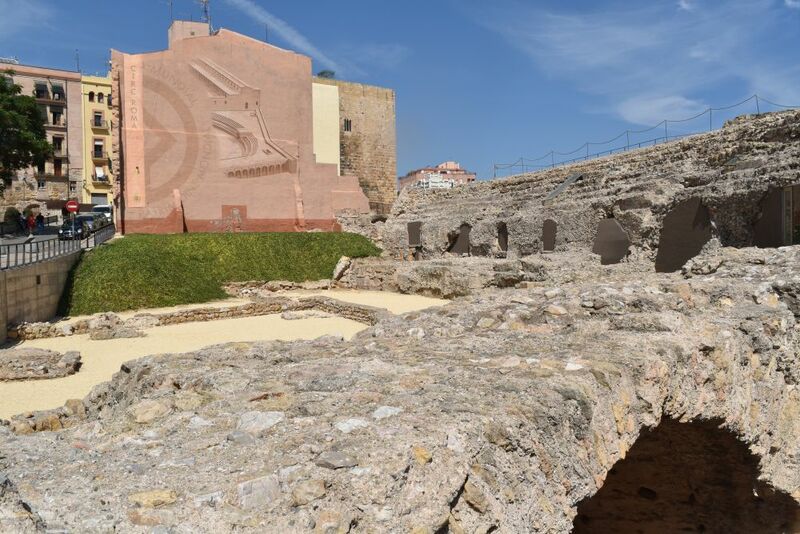 Our next target is the Roman aqueduct built to supply water to Tarraco. 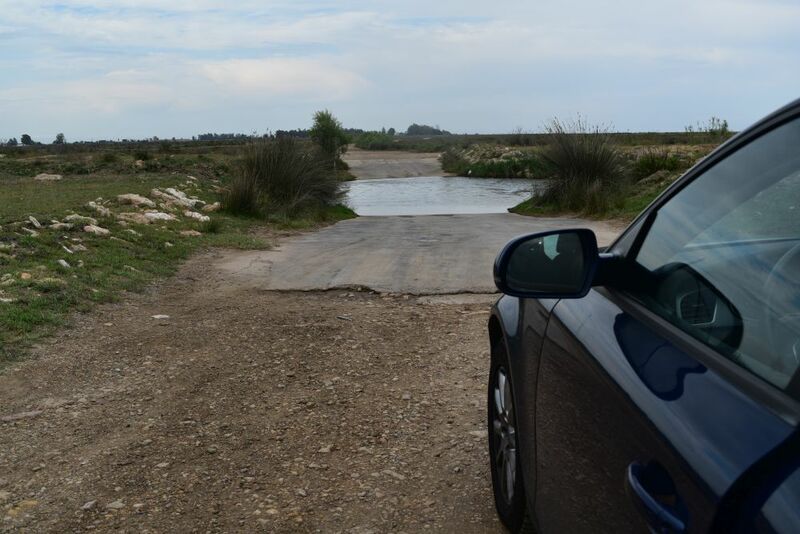 We find the access from the N240 shortly before entering Tarragona. Here it is crossing the valley. 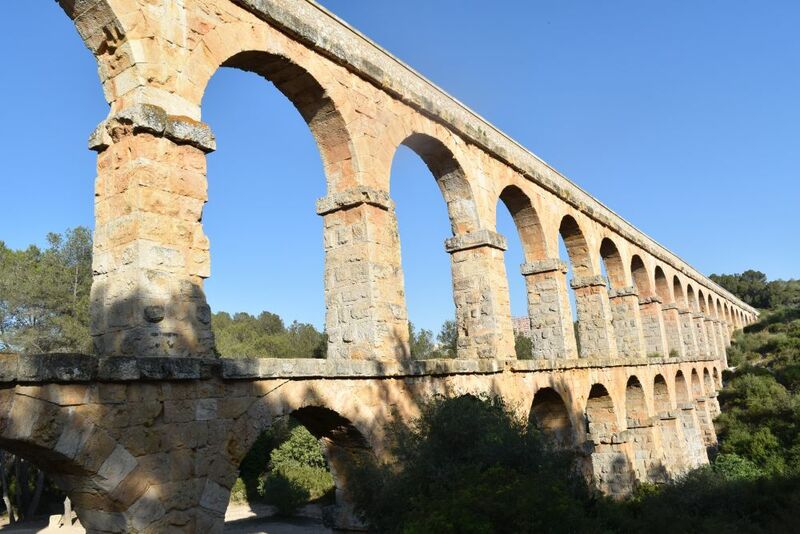 This aqueduct can also be seen from the motorway – there is a platform providing the view of it – for those travellers that are in a hurry. 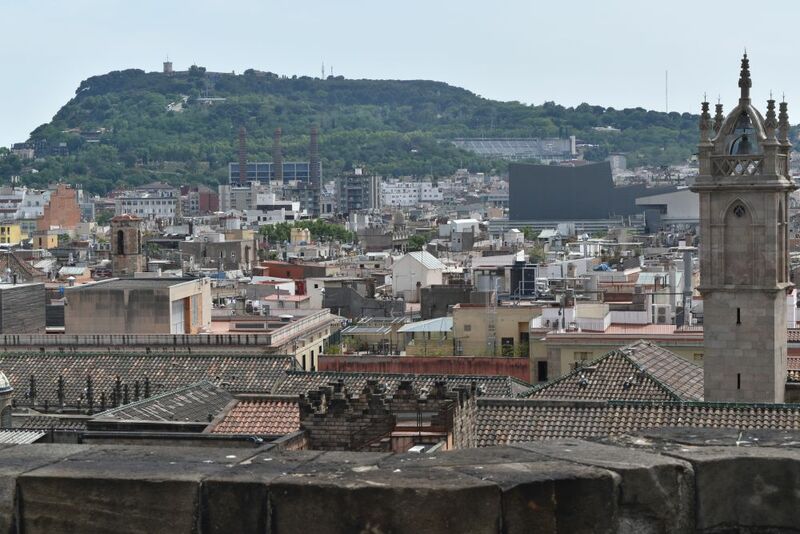 We cross Tarragona and follow the street canyons of Salou and Cambrils. No, we would not like to stay in one of these skyscrapers with beehive apartments. 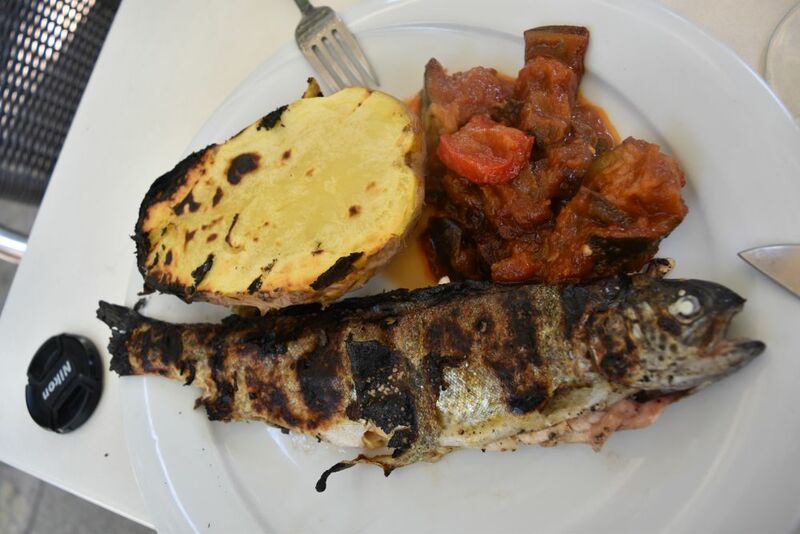 But – Ursula has found the excellent restaurant Les Barques here, where we have some delicious seafood before returning to our apartment in Hospitalet – yes, we enjoy the relaxed atmosphere and the great view of the pine trees and the sea from our spacy balcony. 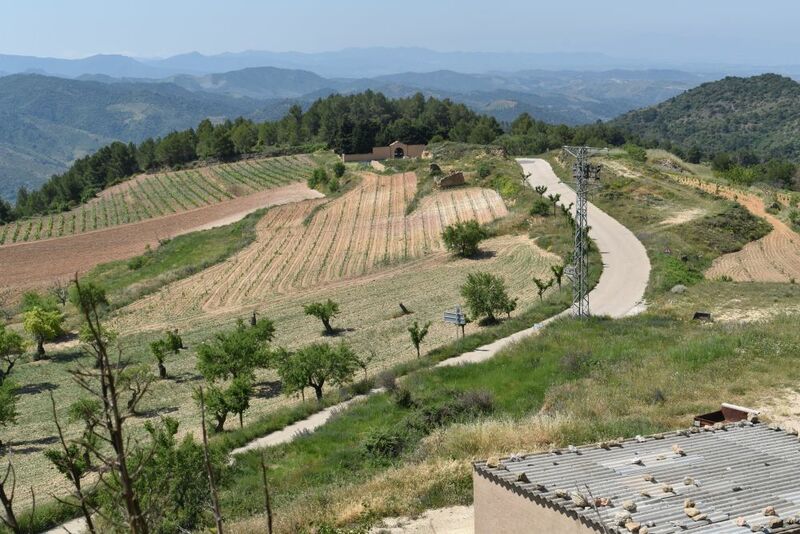 Just 30km away from Hospitalet – this is what we discover on the map – there is the small town Falset (‘Falset – accent on the first syllable) which is the gateway to the DOC wine region Priorat and the adjacent DO region Montsant . On the map we select a round tour from Falset to Gratallops and back to Falset. Later we will return to explore the Montsant region with Escaladei (literally staircase to God). 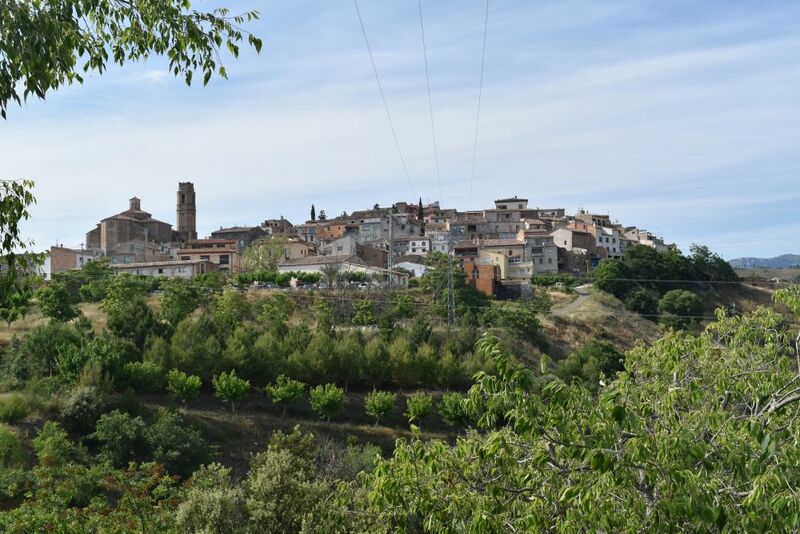 Falset is a charming small country town located in a friendly broad valley with olive trees, fruit trees and vineyards. There are many wine cellars, the most known one being the Cooperativa Scala Dei. 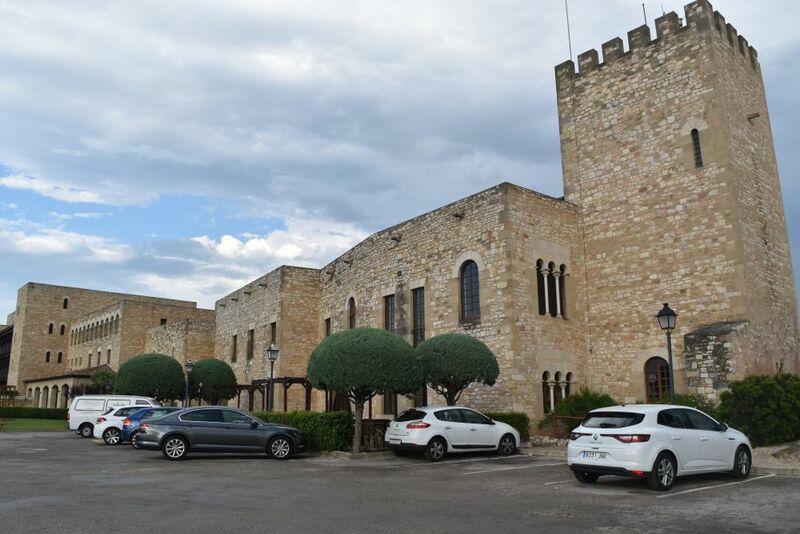 Falset also hosts an enology school and a wine technology institute called Vitec that allows the local wine growers to analyze and optimize their wine production. I found this in Miquel Hudin: “Vinologue Montsant”, Liberdúplex 2004. The town is quiet on this Sunday, the restaurants are full with people eating around three in the afternoon (the normal time for lunch in Spain). We continue north towards Gratallops. Our road climbs and meanders through steep and rocky hills. No vineyards. I am surprised. 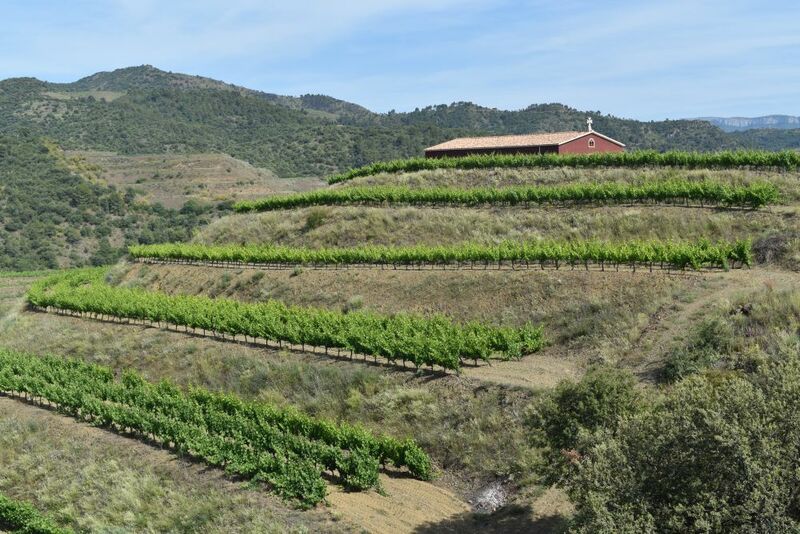 Where are the Priorat wines? 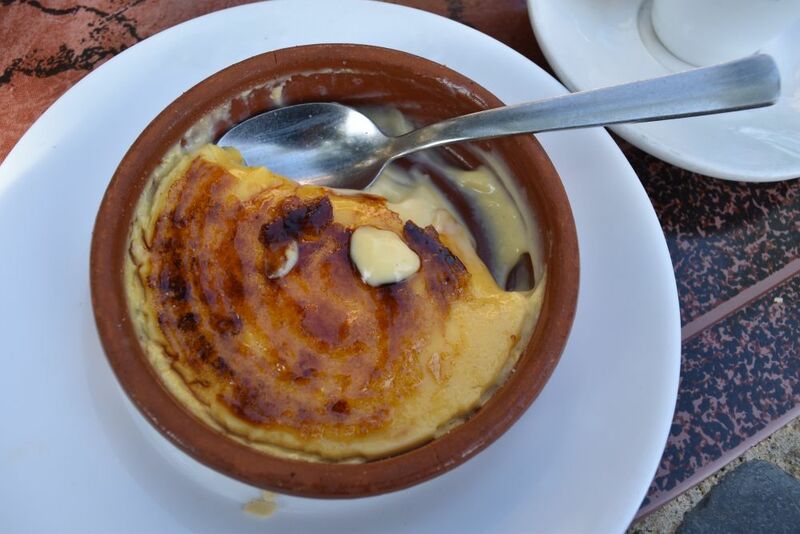 We have a coffee and a crema Catalana in the restaurant “La Cassola del Priorat”. Around this place we can see the first vineyards, terrassed on steep hills. The vines are loosely arranged, it must be hard to grow wine here. Behind the next hill appears this gorgeous village perched on a hill. This is Gratallops. and a restaurant closed right now, on Sunday. Also the shop selling honey is closed today. One shop is open. 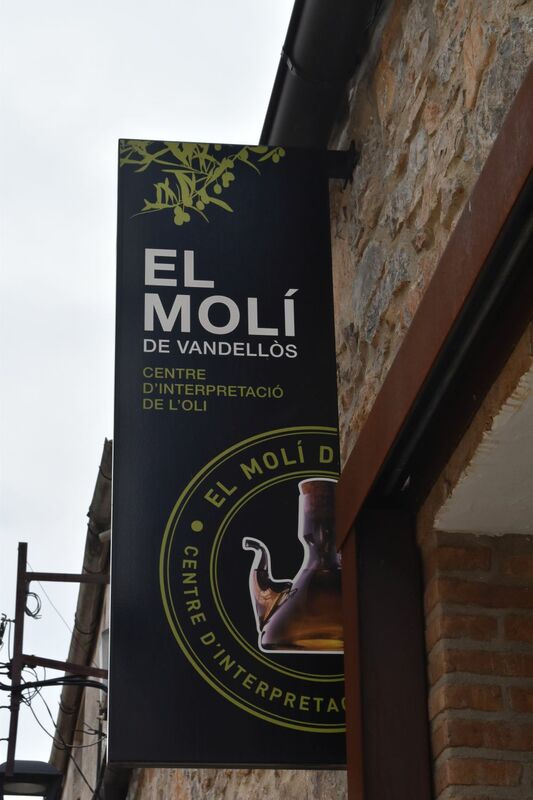 We buy some wine – Garnatxa red (Lluna Vella) and white (l’Udol), a bottle of Vermouth by de Muller, some local marmalade and the guide to the Montsant wines by Miquel Hudin. Three innovative wine growers have their cellars just outside of Gratallops: Alvaro Palacios, René Barbier and Carlos Pastrana. This is for some other time… I would have had to call them beforehand. 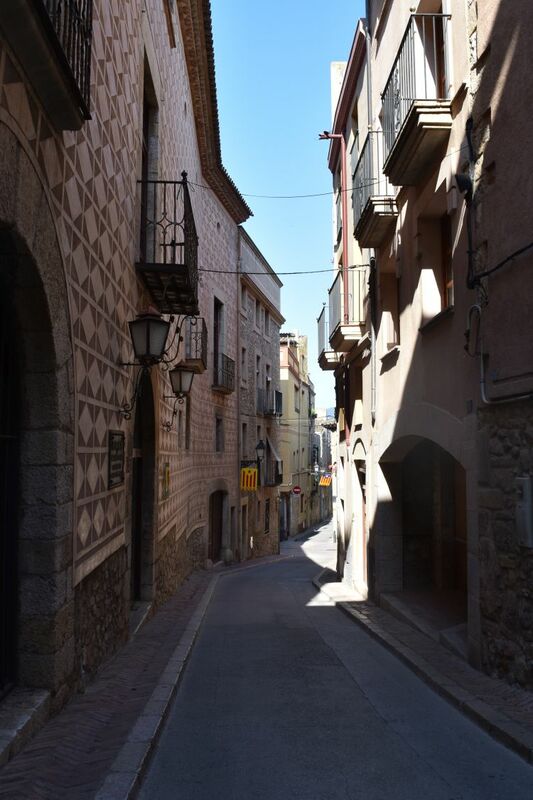 We continue our way along a narrow street above the Siurana river. 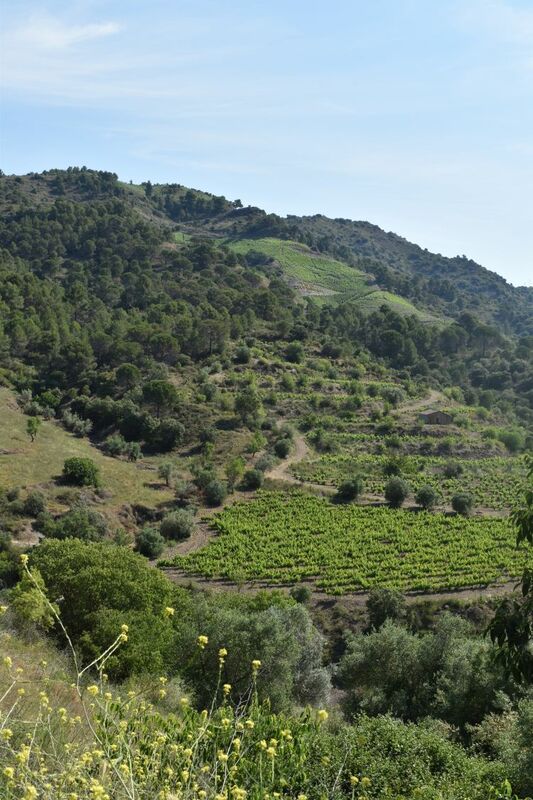 Around us the steep vine gardens of the Priorat. 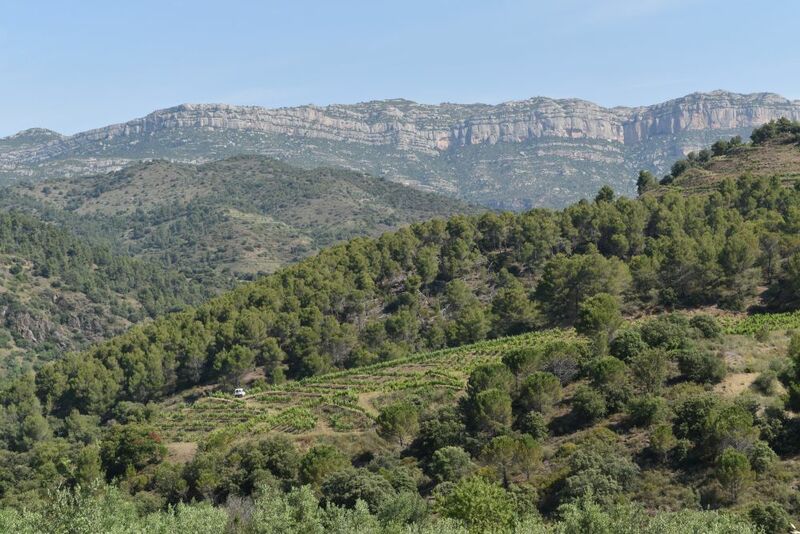 Torroja of Priorat is just above the river Siurana. The road winds uphill with vineyards and olive groves on steep slopes. 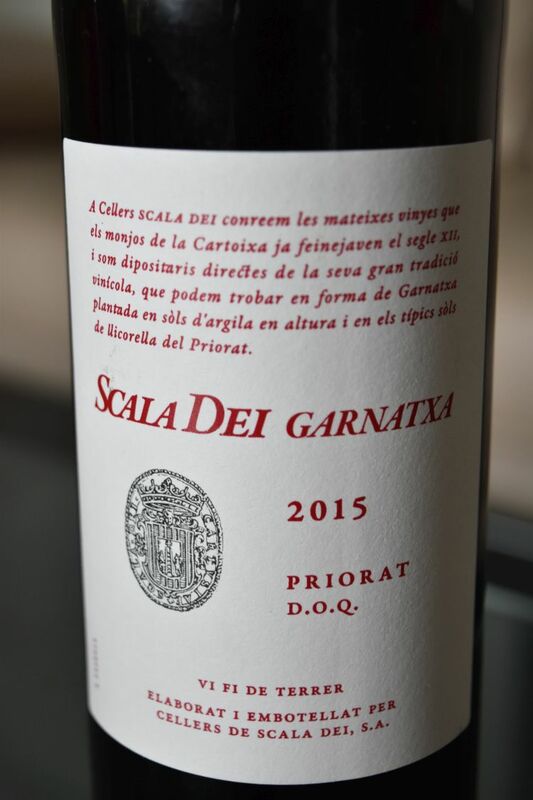 I had not imagined Priorat being so precipituous. 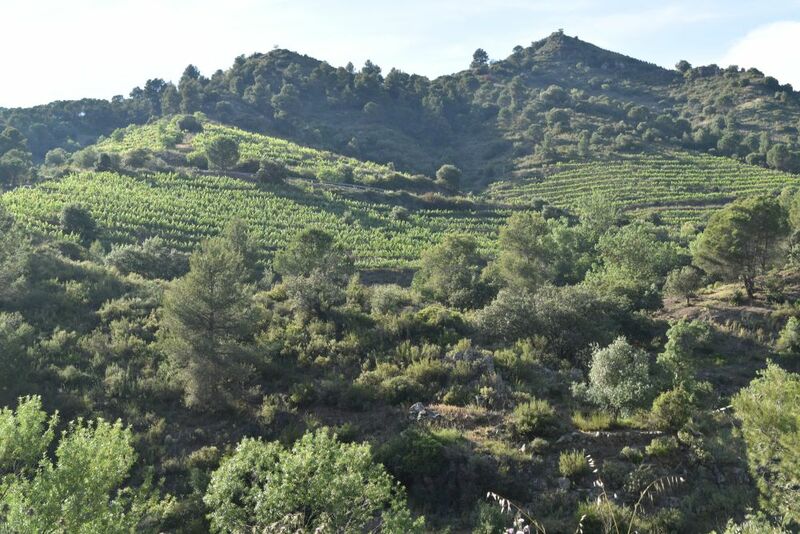 In the “Vinologue Montsant” I read that in the DOC area of Priorat, 90% of the vines grow on llicorella slate (slate mixed with quartz), while DO Montsant has many different soils which also makes it interesting, as winegrowers start to produce wines exploiting the variety of the terroir. 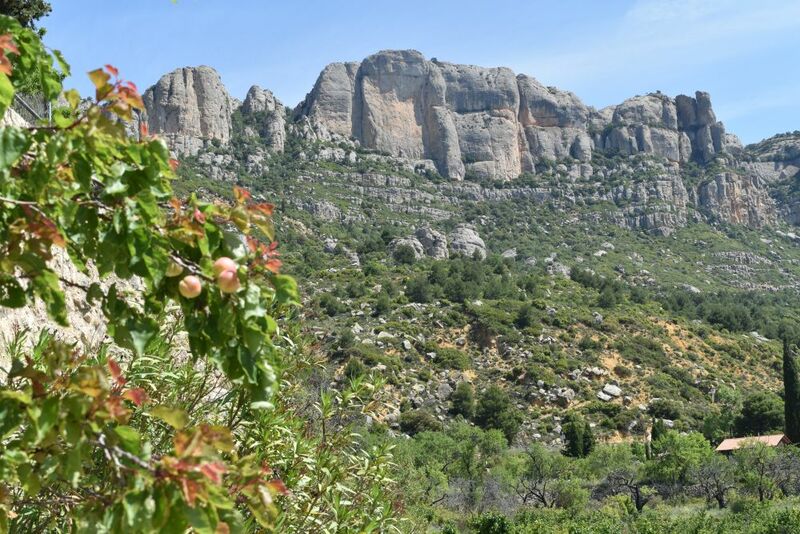 In the background we see the rocks of Montsant. Prices for wines are not as high as in the Priorat region, where prices reach even several 100 Euros. The Canadian Miquel Hudin fell in love with Monsant and wrote his book “Vinologue Monsant”. 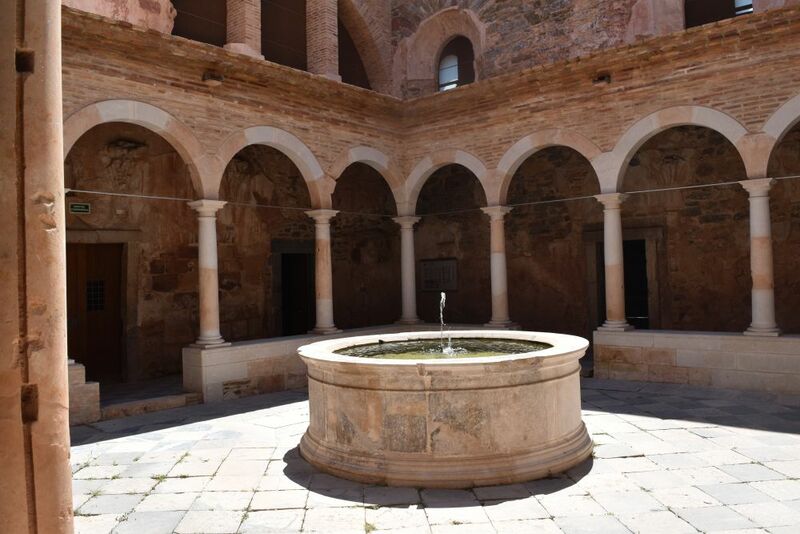 While already the Romans had grown wine here, this tradition was interrupted during the Moorish reign, until 1153. 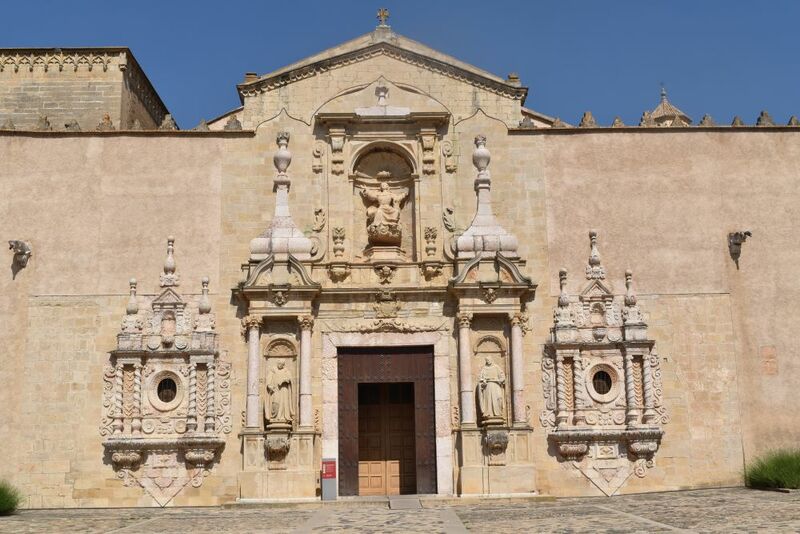 Then the “Cartoixa de Santa Maria d’Escaladei” was founded as the first Carthusian monastery in today’s Spain. A shepherd had a vision here: Angels climbed a staircase to heaven. Hence the name “scala dei” or “staircase to god”. 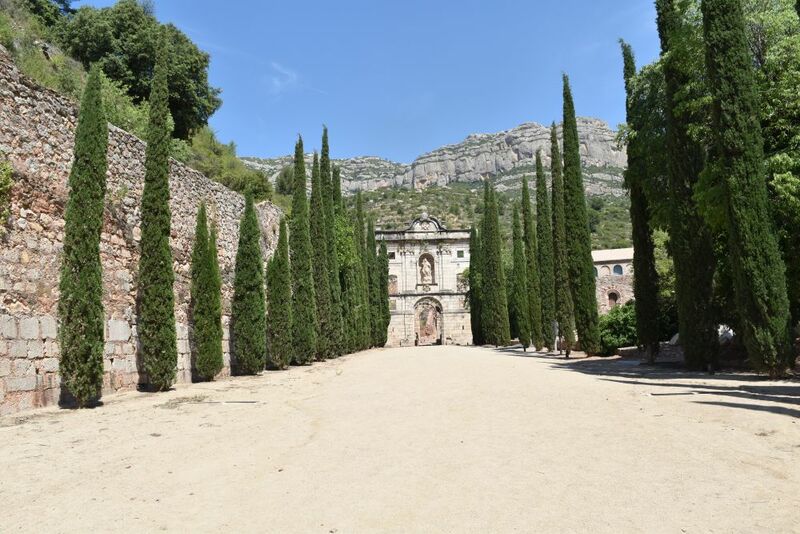 The monastery owned the land that subsequently was called “Priorat”. In 1835 the ecclesial possessions were abolished and the farmers destroyed the monastery. 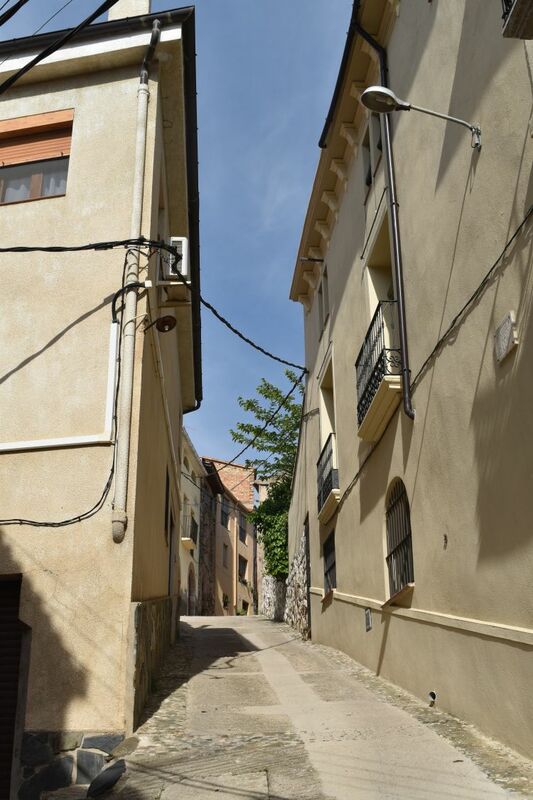 A friend of ours owns a small apartment in L’Hospitalet de l’Infant south of Tarragona. We find an unpretentious small town with great sand beaches that are still quiet in the beginning of June. Most holiday apartment houses are not more than three storeys high, no construction “sins” here. Our apartment is modern and has a large balcony from which we can see and hear the Mediterrenean Sea. Quite a large swimming pool belongs to our house. We will stay here for about ten days relaxing, enjoying the local fish and wine and exploring the area. Our first excursion takes us to Vandellòs in the mountains. 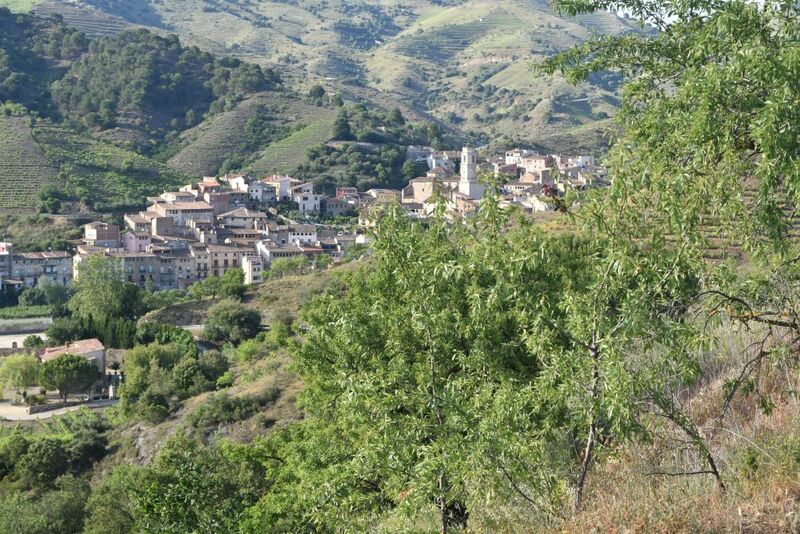 We drive some ten kilometers into the mountains and reach Vandellòs. 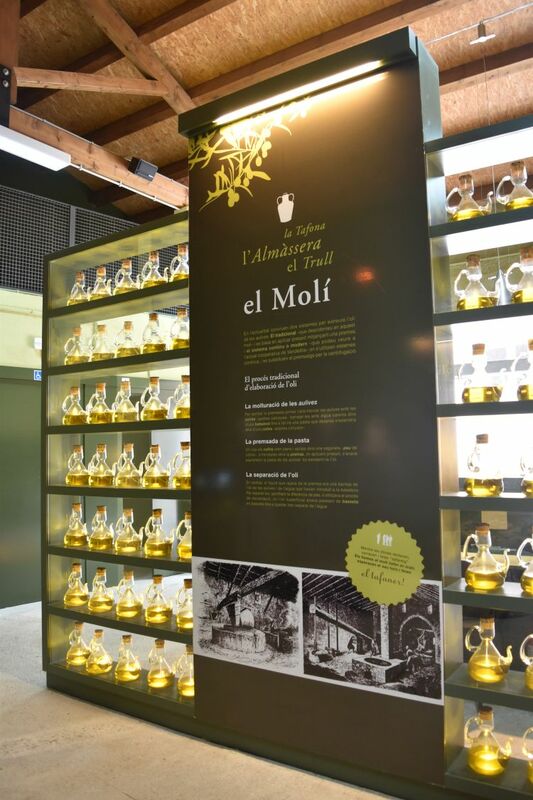 El Molí, the oil mill, is open. We enter. There is a huge shelf with oil carafes. A group of people has just finished a guided tour. The group leaves and the manager looks at us. “You have not reserved – you should have reserved – do you speak castellán?” Yes, we do, and the manager spontaneously decides to show his mill to us – also without us having reserved. We are in the old cooperative oil mill that has been built in the 1920’s. It operated until early this century and is now a museum. The new mill is just next door. The manager explains the oil making process to us. The olive trees growing in the region are called Arbequí, Regue and Salivenc. 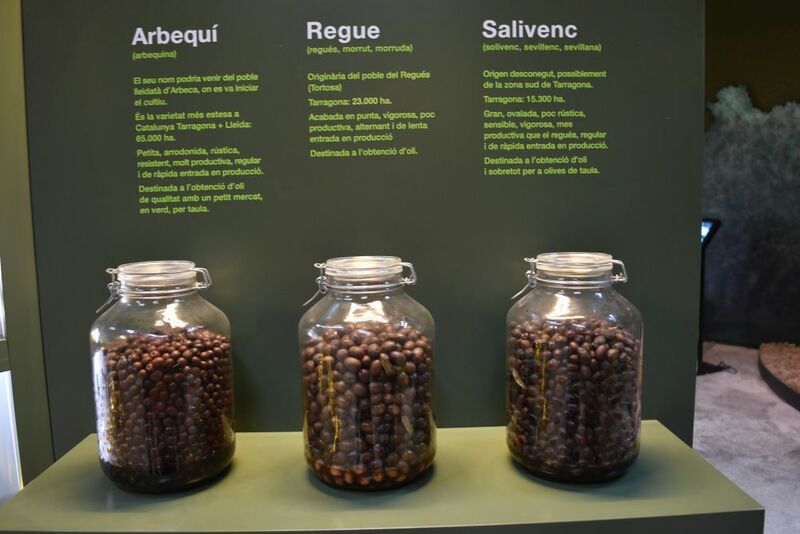 Arbequí is the main olive – the olives are very small. The trees are about two meters high. 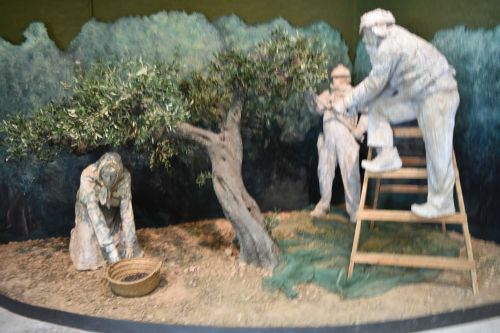 The men used to collect the olives standing on small ladders while the women picked the olives that had fallen on to the ground. Today, the olives are taken directly from the trees. 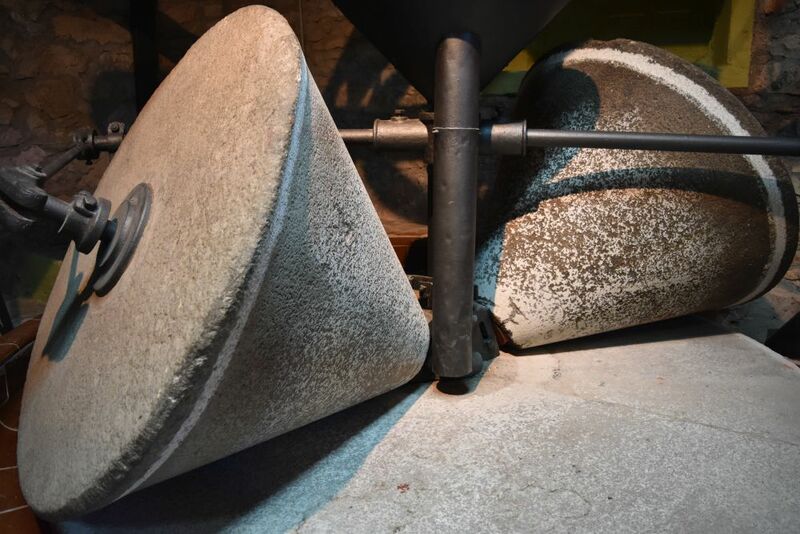 The mornings are reserved to collect the olives and in the afternoon they are immediately processed. Olives with bones and branches are smashed in the mill. The smashed mass is then packed into flat baskets. 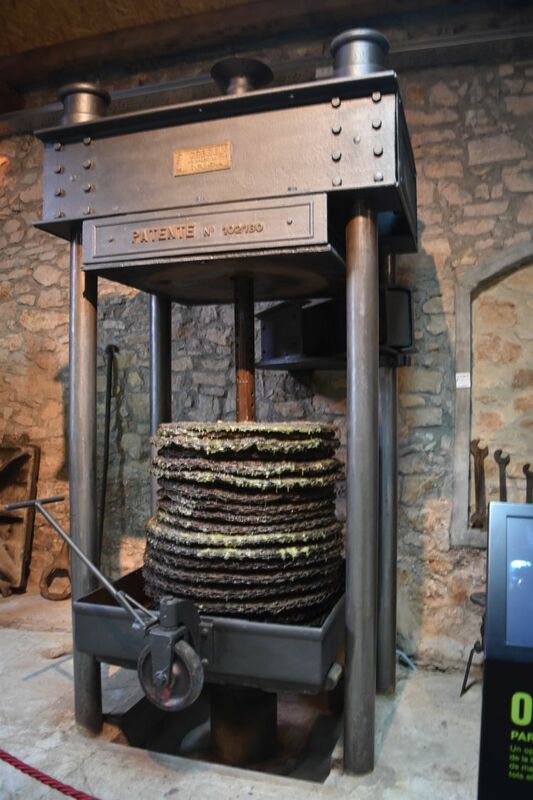 The baskets are piled on top of one another forming a tower that is pressed to extract the liquid. Pressing occurs once to extract extra virgin oil. The resulting liquid is a blend of water (at the bottom) and oil (on the surface). The oil needs to be skimmed using a spatula. Olive oil is versatile. 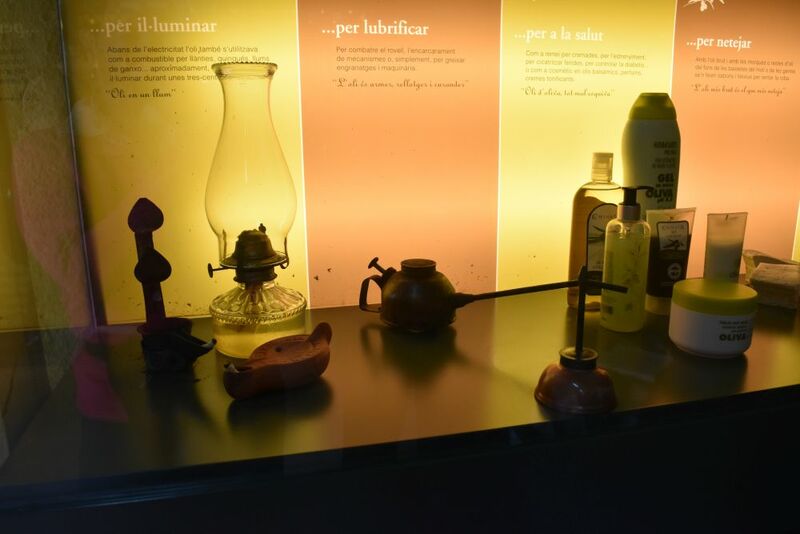 It is used in the kitchen, but also for health products and for cleaning – and even for lamps. To round off our tour, the manager offers us a piece of bread with olive oil. Delicious. 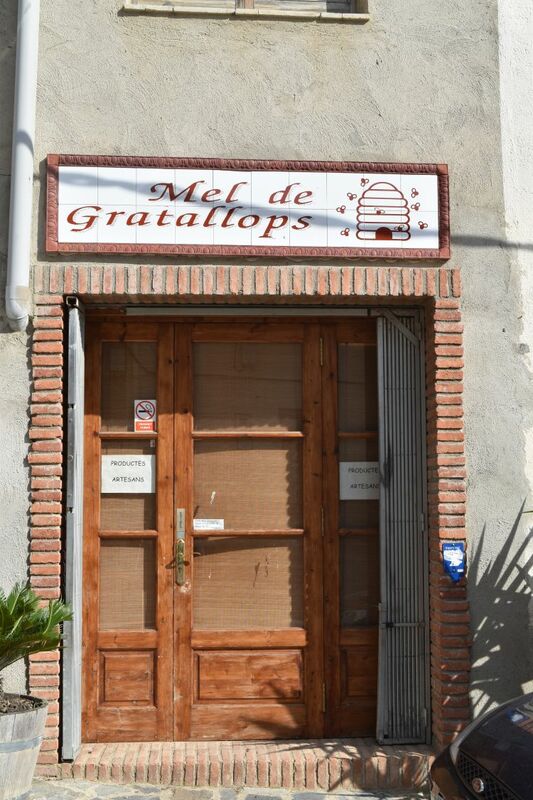 There is a shop next door, where we buy some olive oil from Vallendòs and some more local products like honey and jam. This will be some nice presents for the neighbours back home. There we are on the road again… Our target is the North of Spain near Tarragona. Ursula has a friend that owns an appartment near Tarragona. We drive to Martigny first to get the key and then we drive through France with an overnight stop. Ursula joins me in Zurich. 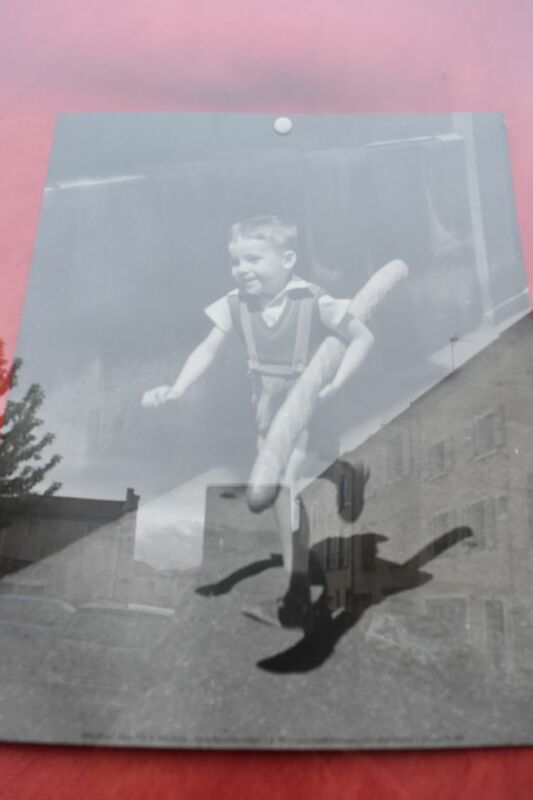 We drive to Martigny in the Valais to see the exhibition of Zao Wuu Ki in the Fondation Giannada. Beautiful, I like his abstract paintings – each of them reminding us of a landscape – a sun rise, a salar lake or a sea shore with waves in the background. Then I show Ursula the windows in the protestant chapel painted by Hans Erni, when he was 103 years old. We read about the other catholic chapel and the paintings of the monk Kim en Joong. 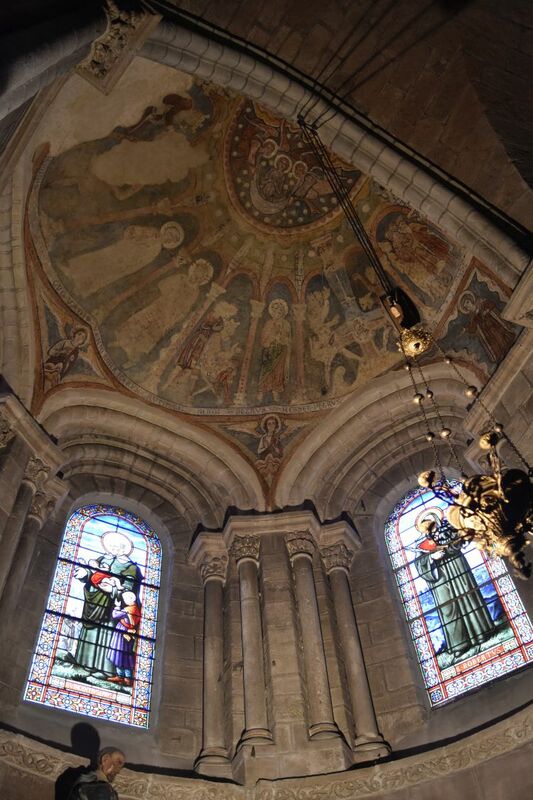 Ursula sees that he has also made the windows of the Basilica St. Julien in Brioude in the Auvergne. This is about half way to Tarragona. We decide to stay overnight at Brioude. We drive along the lake of Geneva in France. 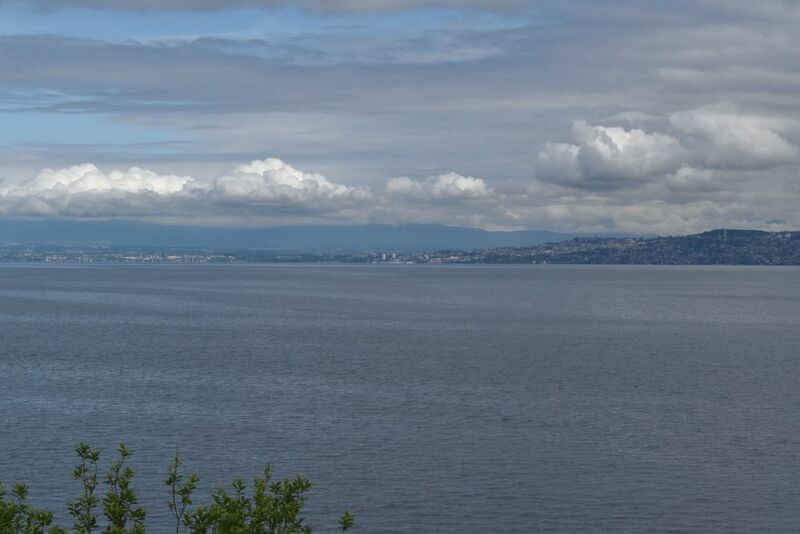 This is the view of the Swiss side of the lake. Then we head to Bourg-en-Bresse and the Auvergne, crossing one valley after the next on the motorways… up and down… up and down. 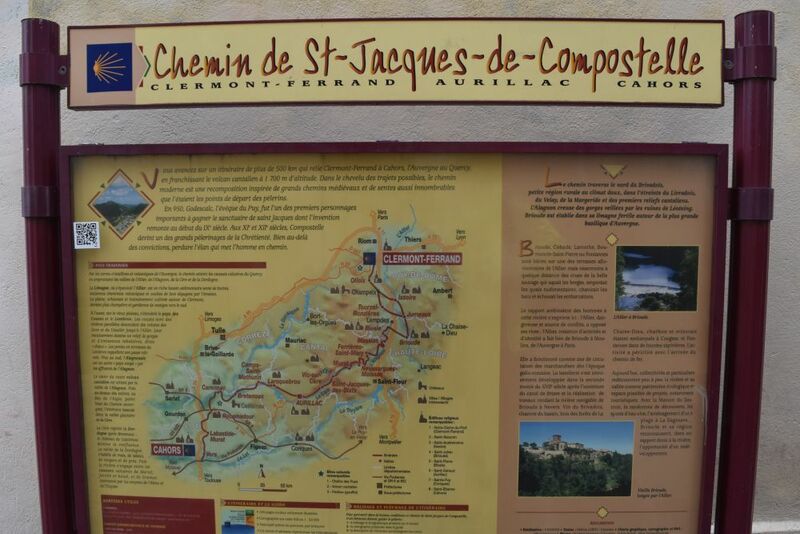 Brioude is located on the St. Jacob’s pilgrimage route. 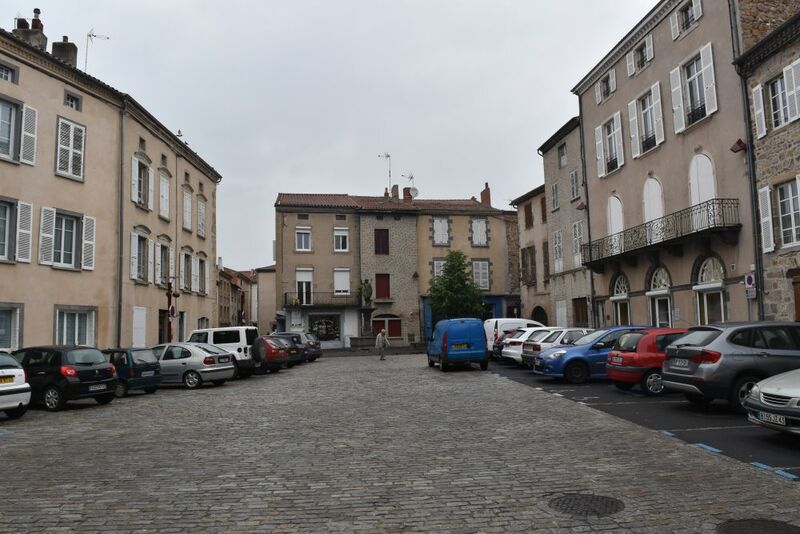 It is one of these cosy and quiet country towns that I love France for. 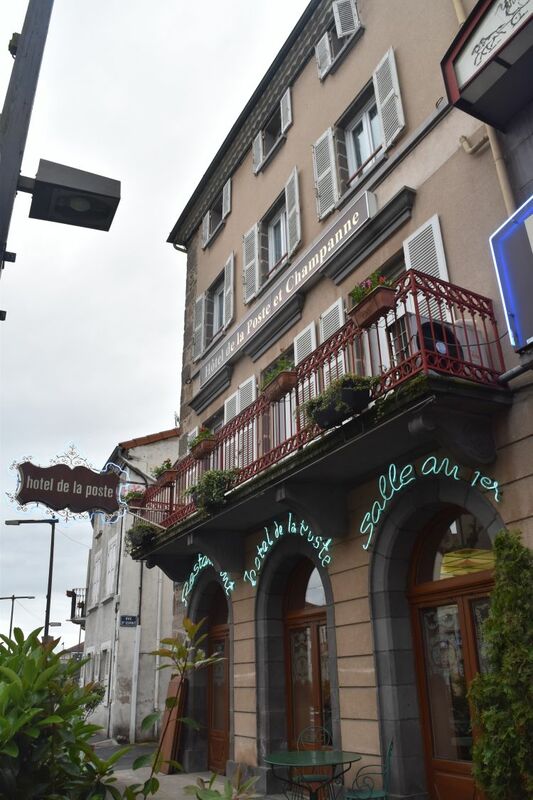 The tourist office shows us the hotels… and seems to recommend the Hotel de la Poste. “Two stars, but very good,” she says. How true. We find a friendly reception and a comfortable room in the annexe. 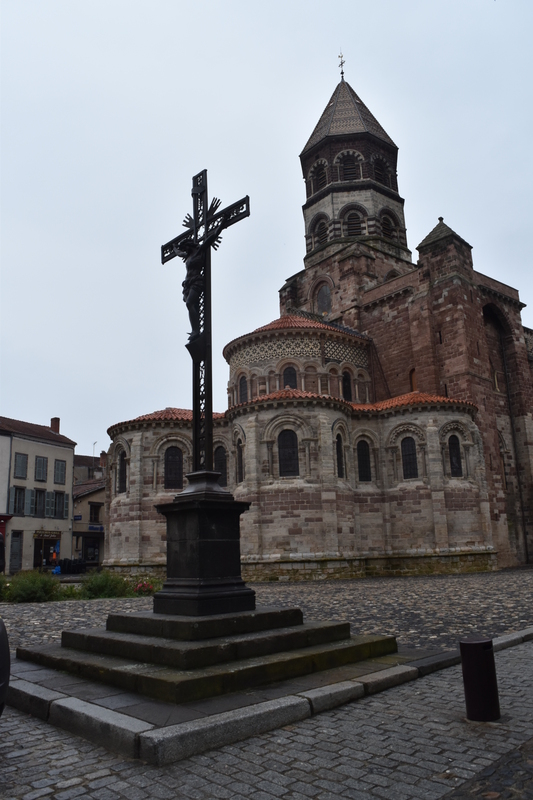 The center of Brioude is the Basilika St. Julien from the 11th century built at the place where Julien had been decapitated by Roman soldiers. The style is Romanesque. This is the view from outside with the tower of 56m. 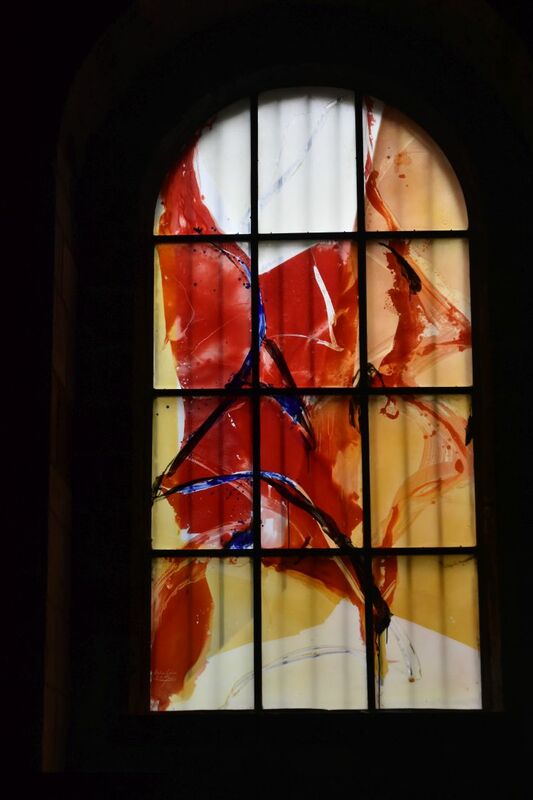 … and one of the 37 windows made by Kim en Joong in 2008. They give a solemn atmosphere to the inside of the church. 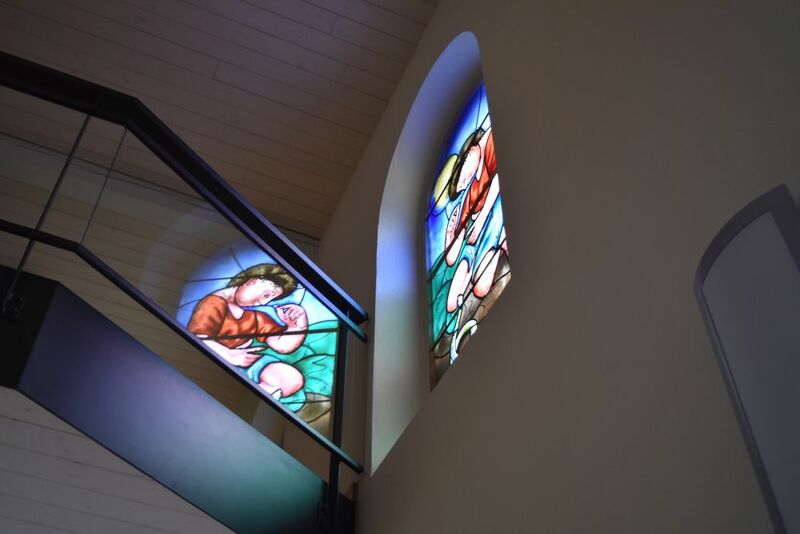 We would like to visit the catholic chapel with his windows in Martigny, when back. There are old frescoes on the columns and in the chapels of the choir. Returning to our hotel we come across a bakery with this very French foto of the fifties or sixties in the last century. Very French… and welcoming. The hotel is a gem. 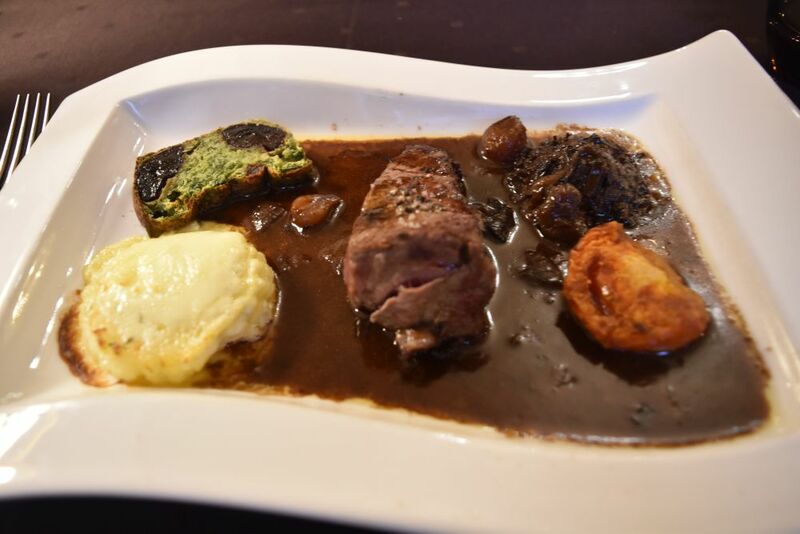 In it, we find one of these home like restaurants that I only know from France. Ursula feels like the menu with two main courses, and I join her. 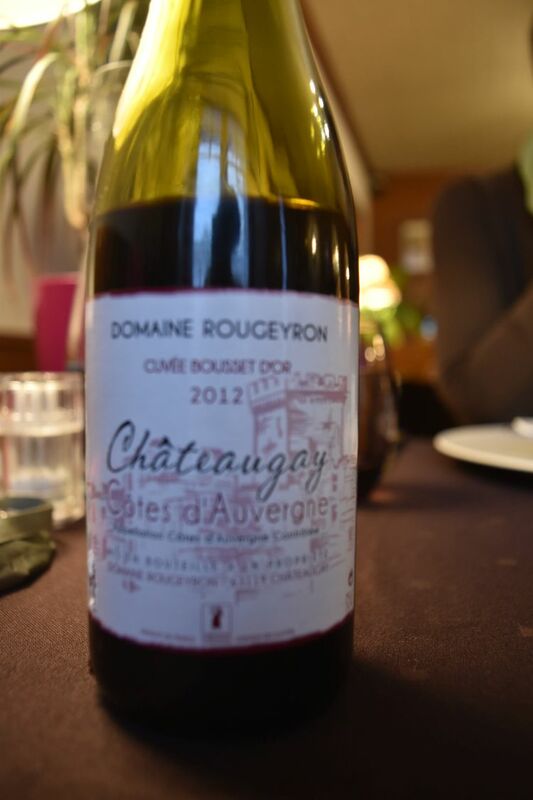 I order this local Gamay from the region of Auvergne – it is a perfect match with the regional meal. The first dish is poultry terrine. Our main course is beef with potatoes au gratin and a spinach pie. Delicious. 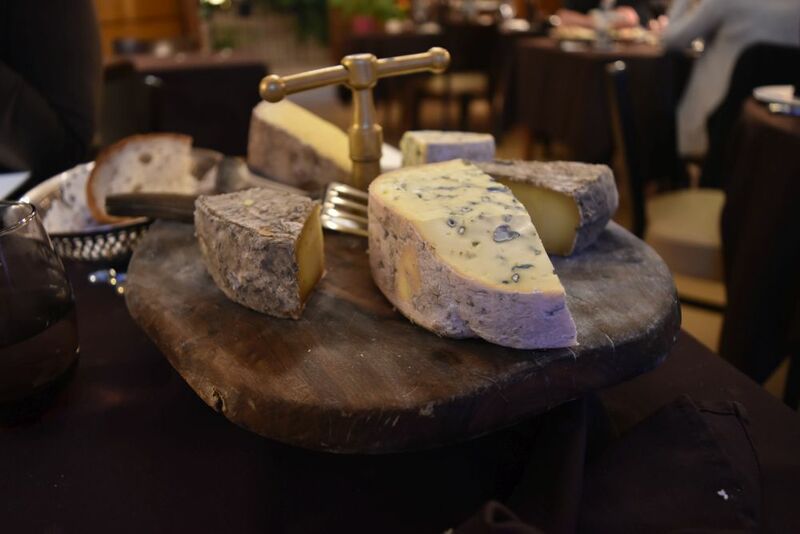 The selection of local cheese like Bleu d’Auvergne or Saint Néctar are also a good match with the Gamay. 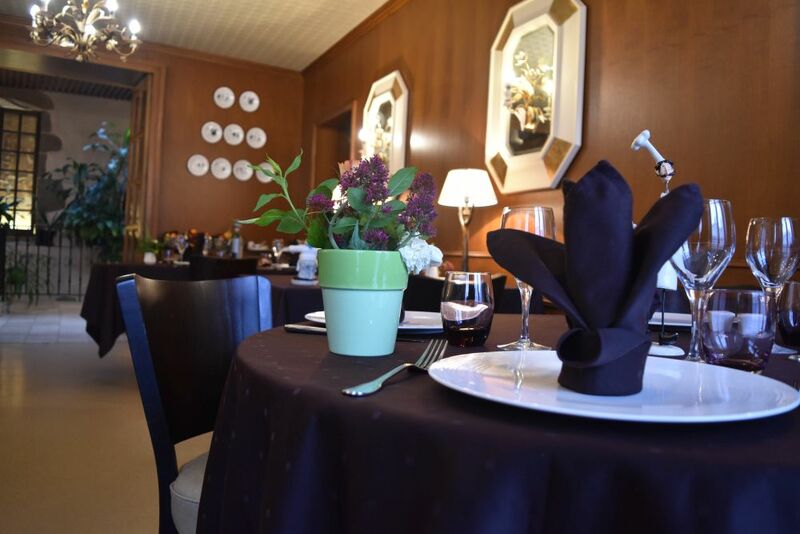 We sleep well in our quiet and comfy annexe and in the morning enjoy breakfast buffet prepared with care and love – all fresh regional products of the Auvergne.